Ironduke has released a side-project he whipped up when he wasn't working on TacOps. 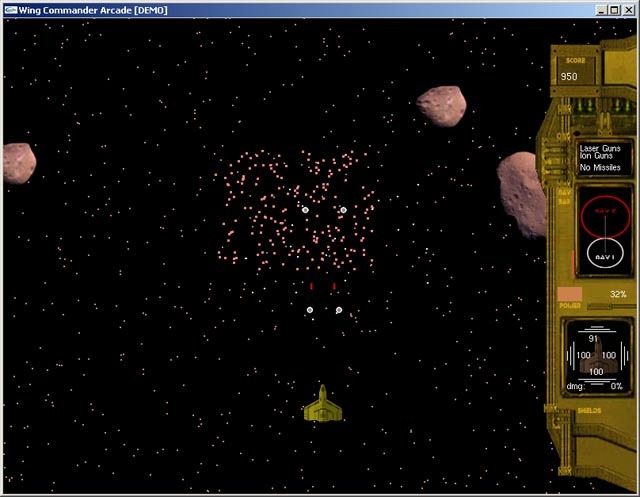 It's a simple Asteroids clone featuring a Rapier II and handful of rocks. 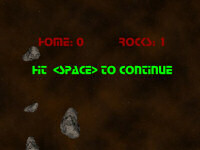 The game doesn't know to end when the rocks are all gone and there's a few bugs, but it's a fun little tech demo. 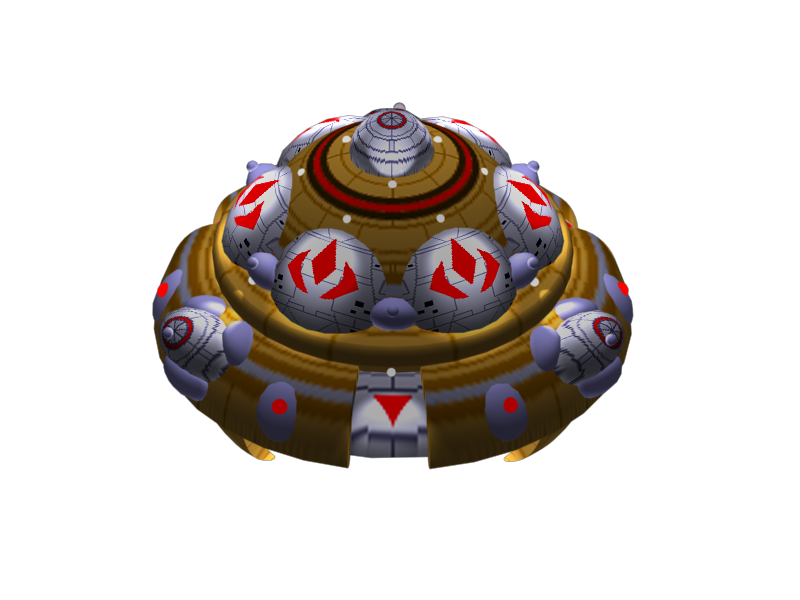 Duke isn't planning to go back and add anything, so players will have to wait for Arena's Meteor Storm mode for something more elaborate. You can download WC Asteroids here (1 MB). SakakinoRisa has a cool new toy for us to play with - a Hornet light fighter for X-Plane 8.5! X-Plane is a flight sim toolkit with a massive amount of user generated content... everything from super-realistic airliners to orbital Gemini Capsules! 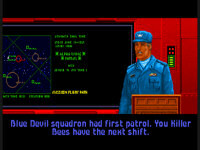 The Hornet, of course, is the first fighter ever flown in the original Wing Commander. 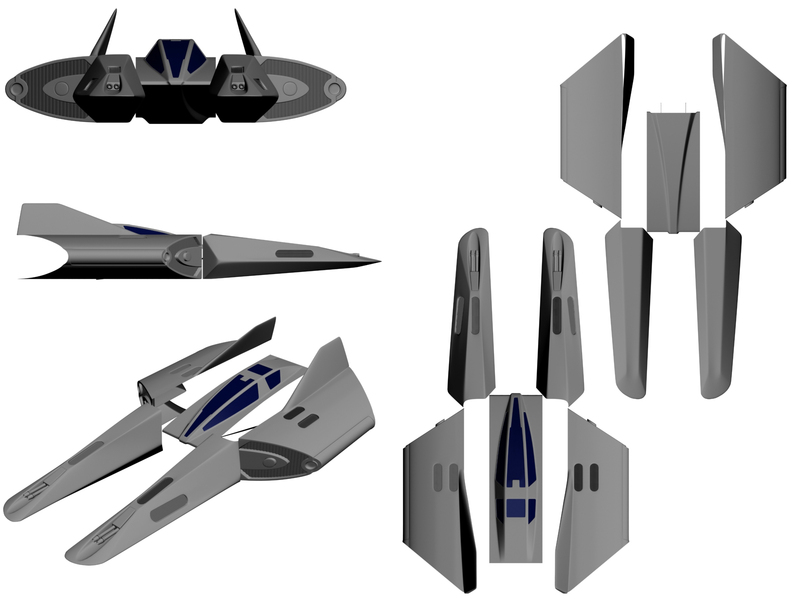 You can download the fighter here. 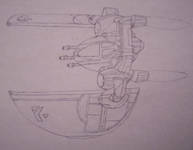 Rumor has it that a Rapier is in the works! 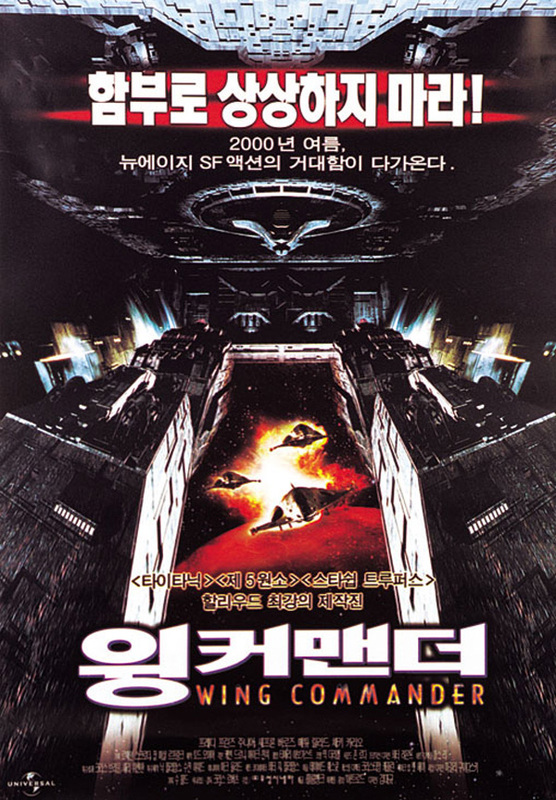 While searching the internet, AD stumbled across a neat poster that most people haven't seen before: the Korean WC movie poster. 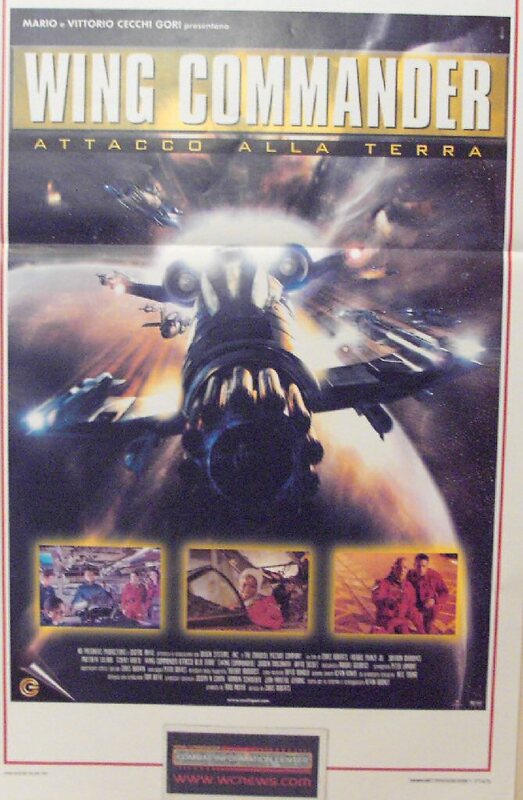 It's totally different from any of the other posters, and it doesn't actually include anything recognizable, but it's a great addition to the collection. It's great that over eight years on, we're still seeing movie products that are new to most of us. Feel free to click the Discuss link below and provide a translation if you can. 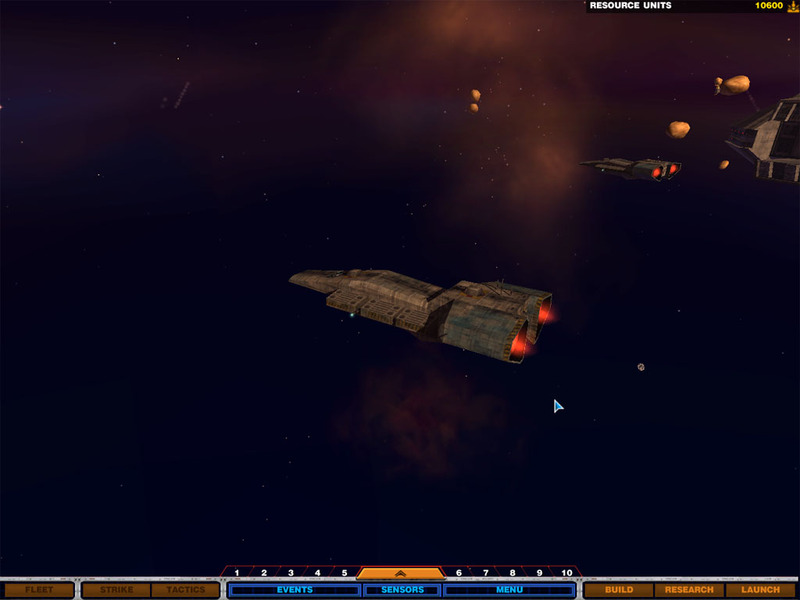 Kosch pointed out a new space sim in development titled Infinity: Quest for Earth. 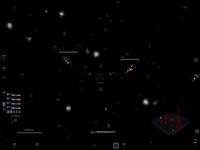 It's a massively multiplayer space sim that features real time space flight and combat. There are no specific classics or races, so players are allowed to pick their paths as they see fit. Regular physics are modeled in the game engine, but ships are "computer controlled" to make piloting easier. 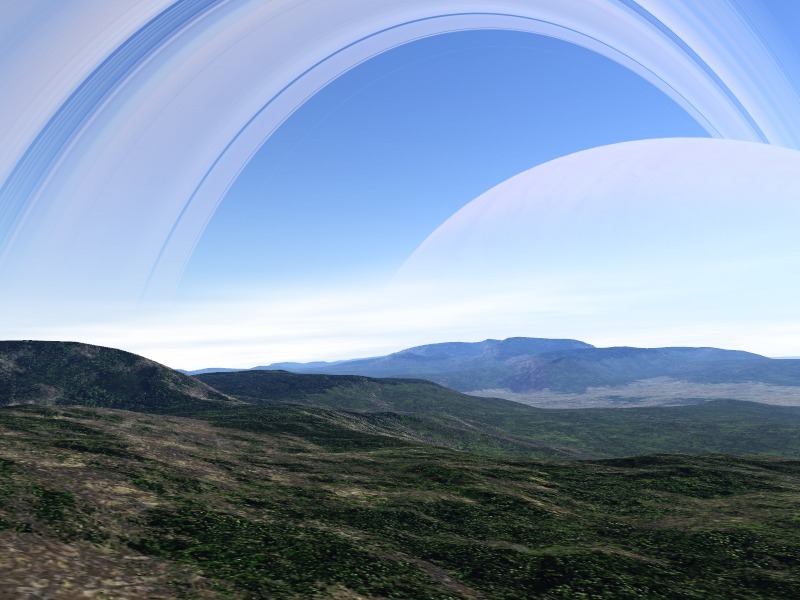 Planets and distances are mostly modeled to scale, and players can land and fly into atmospheres seamlessly. A limited combat test preview was released, but the real game is still estimated to be a year or two away. 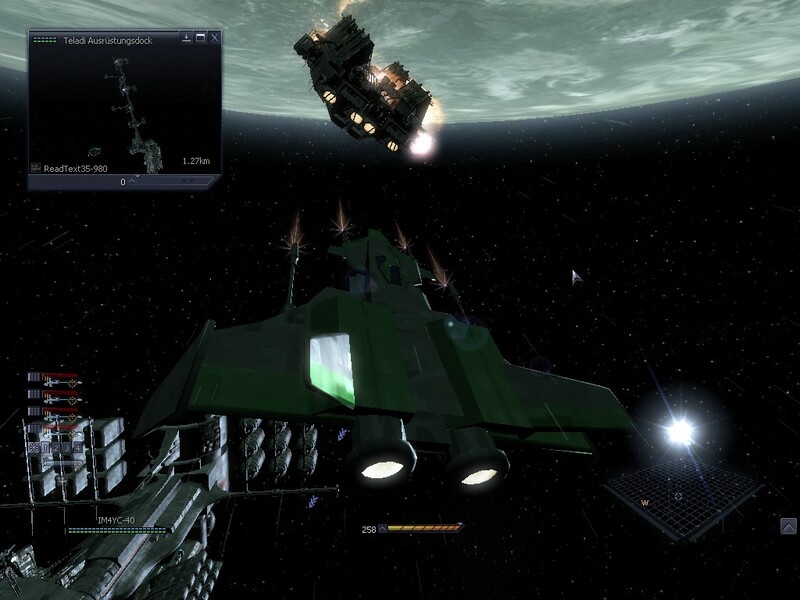 The WC Saga team has touched up the in-game script that manages jump sequences. 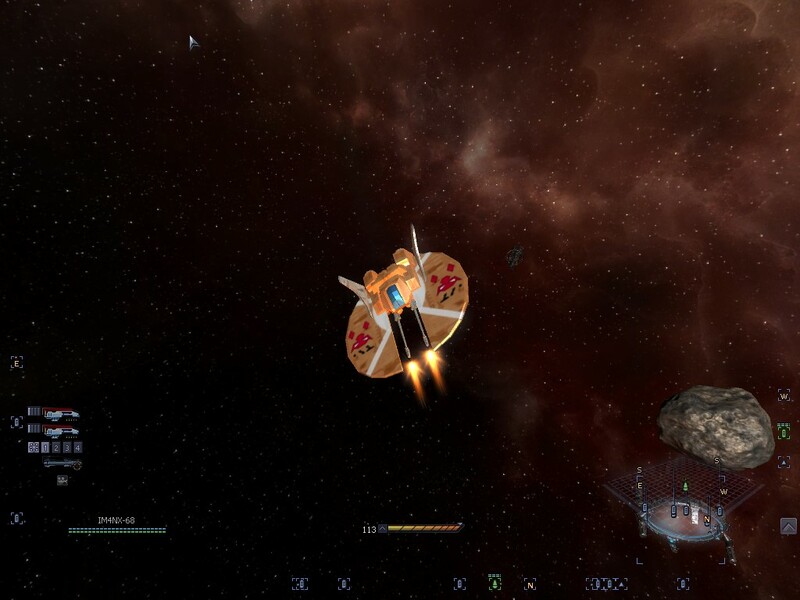 A batch of screenshots has been released that demonstrates a small carrier group transiting a jump point together. 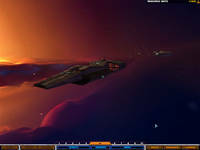 Before players get to see more scenes like this, an update to the Prologue should be released that adds improved autopilot, tweaked graphics and multiplayer. 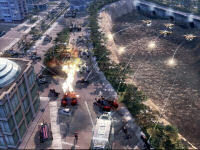 Electronic Arts has announced that the Command & Conquer franchise is about to expand with its first novel. As one of Wing Commander's sibling series, C&C has enjoyed an exciting resurgence over the last year with a large anthology collection and brand new game featuring a high profile film shoot. 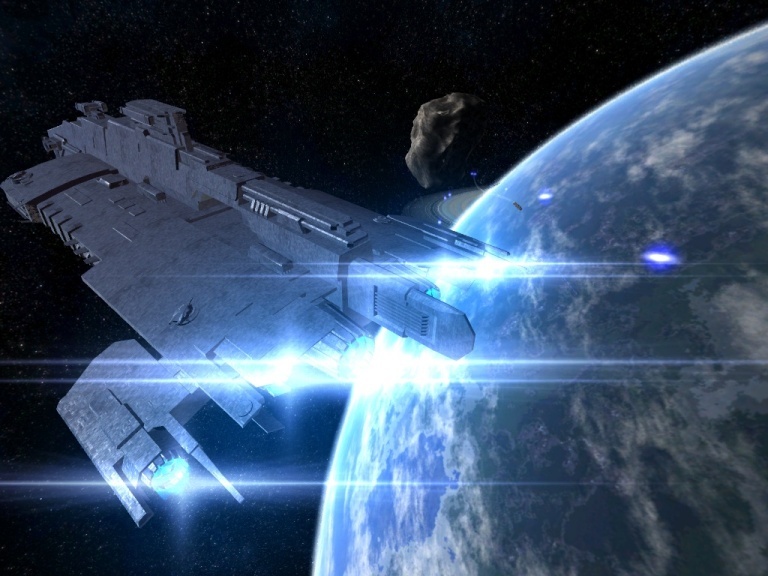 The new book will be a novelization of C&C3: Tiberium Wars. 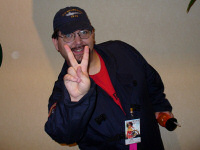 Keith R.A. DeCandido has been chosen as the author, and it will be published by Del Rey/Ballantine. It's set for release at the end of May, a few weeks after the XBox 360 version of the game. 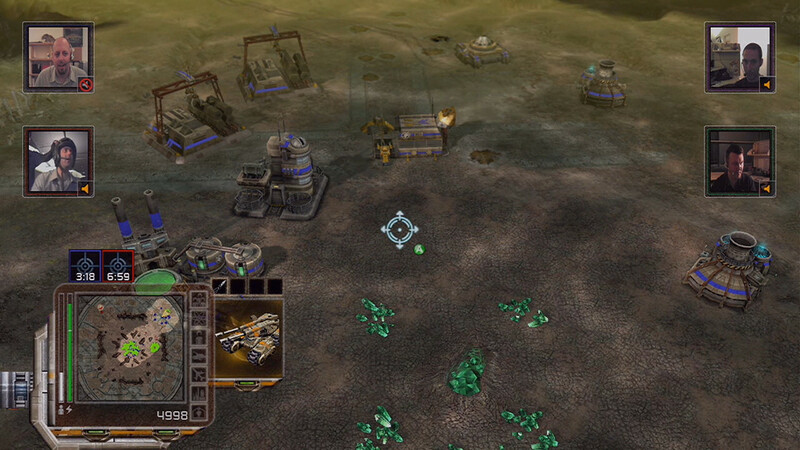 In COMMAND & CONQUER: TIBERIUM WARS(TM), the novel by Keith R. A. DeCandido, the year is 2047 and the stakes could not be higher. 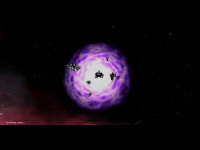 Tiberium--a self-replicating alien substance that has infected the Earth--is spreading like a radioactive ice age. The Global Defense Initiative, a high-tech alliance of the world's most advanced nations, is fighting to contain Tiberium, but Kane, the megalomaniacal leader of the Brotherhood of Nod has other plans for Earth. 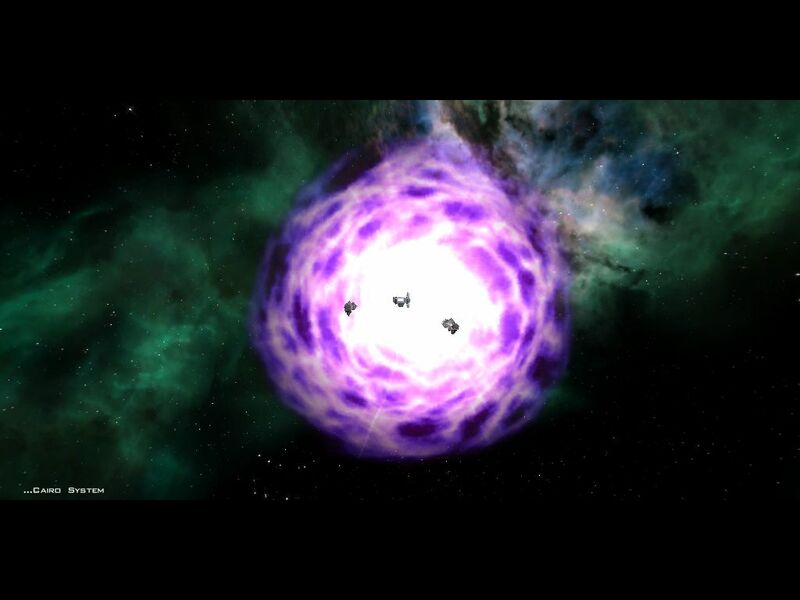 Kane's secret society turned superpower is bent on using Tiberium to take control and transform humanity into his twisted vision of the future. In the midst of battles throughout the world, a third alien race emerges, and all-out war rages over Tiberium. The fate of the planet rests in the balance. 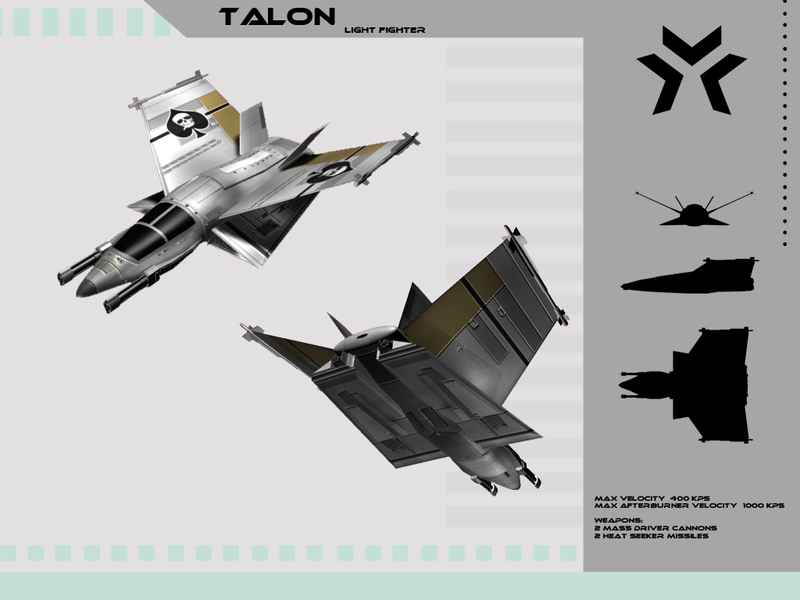 Following on the footsteps of the recent Centurion easter egg, long-time contributor AD has another Arena ship note: the EA Arcade features clip art of a fighter that looks like Wing Commander IV's Razor light fighter. This one is probably not intentional... but it's still worth thinking about! 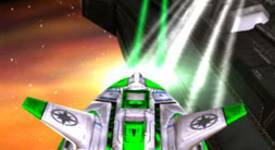 Eurogamer.de has posted a two-page interview with Wing Commander Arena producer Sean Penney! 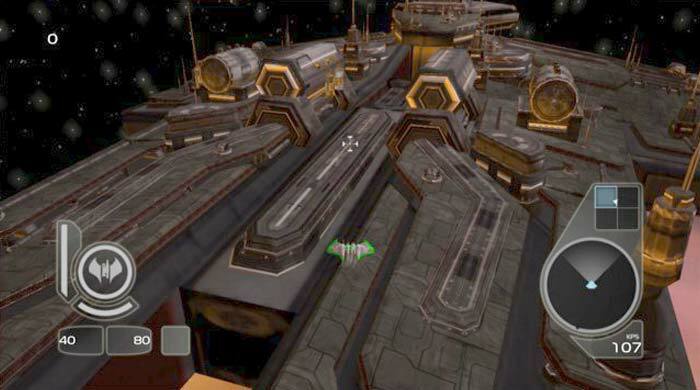 The interview, found here, discusses the game's different modes, addresses fan issues and touches on the history of the series. Unfortunately for many of our readers, it's entirely in German. 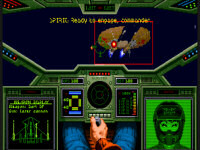 I know there are quite a few German Wing Commander fans out there - would someone be kind enough to translate this exciting article? Contact us and we'll post it immediately. 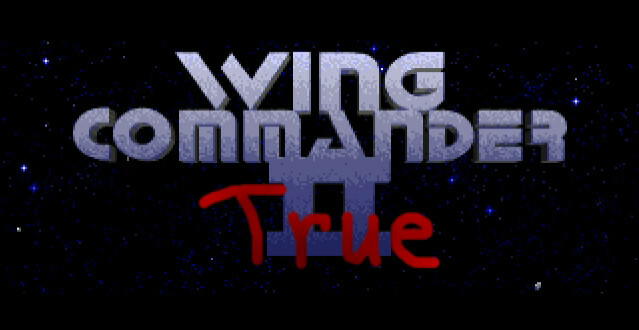 Eurogamer is also running an article on the history of Wing Commander spinoffs, which is available here. Kris has noticed that a scene in Blades of Glory, a recent hit comedy, takes place in the "Xbox 360 Arena". 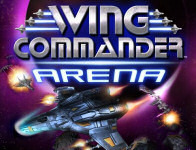 Xbox 360 Arena, Wing Commander Arena for the Xbox 360: simple coincidence, or... well, yes, coincidence. 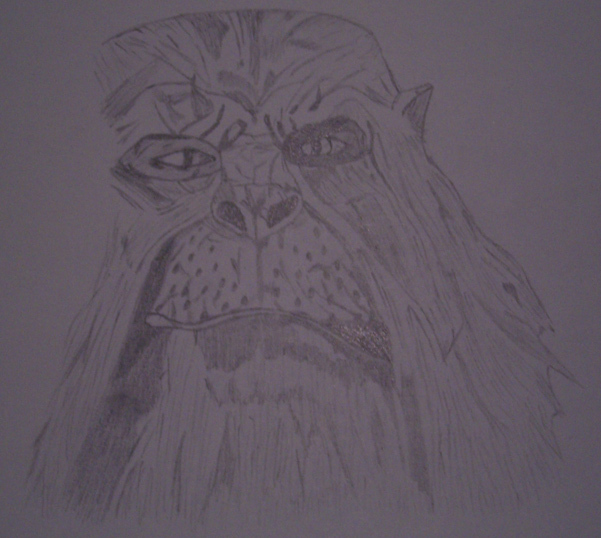 First sketches... then comics... and now a movie! LeaderOne is back with a Wing Commander 2 parody of those Budweiser "wassup" commercials. The characters movements are surprisingly well timed, making it very funny -- check it out! 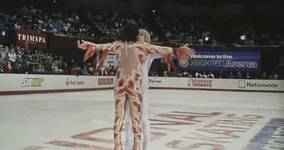 You can download the video here (4.9mb MOV file). Hot on the heels of his clay armada, Mustanger has turned to wood for his next creation. 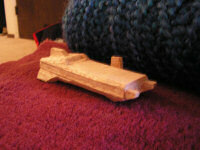 The wooden hull of his Confed Light Carrier is mostly complete. 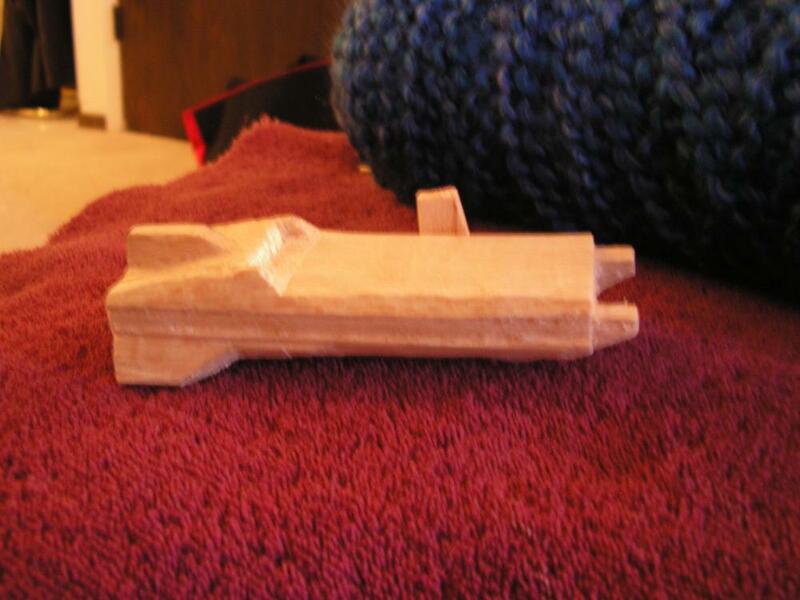 After some finishing touches, the ship will be ready for paint. 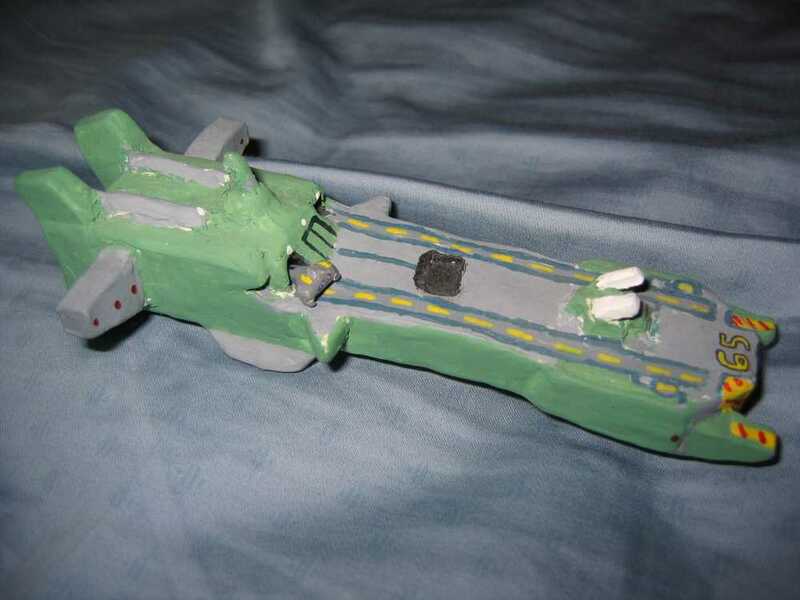 If the clay version is any indication, the final product should be pretty sharp. 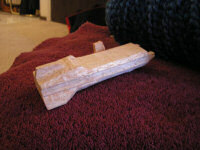 My next project is carving the Victory out of a wooden block. 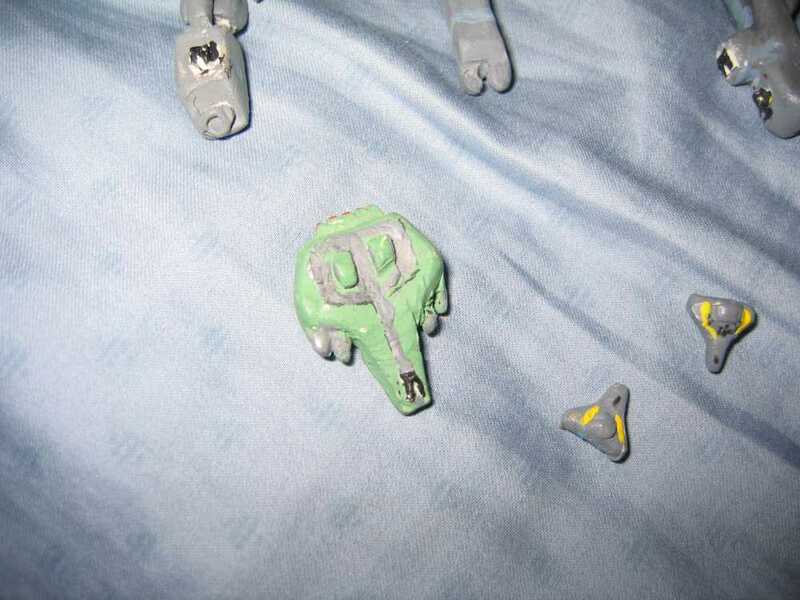 Should be able to make it a bit more accurate than with the clay I think. I'm pretty happy with the results so far. 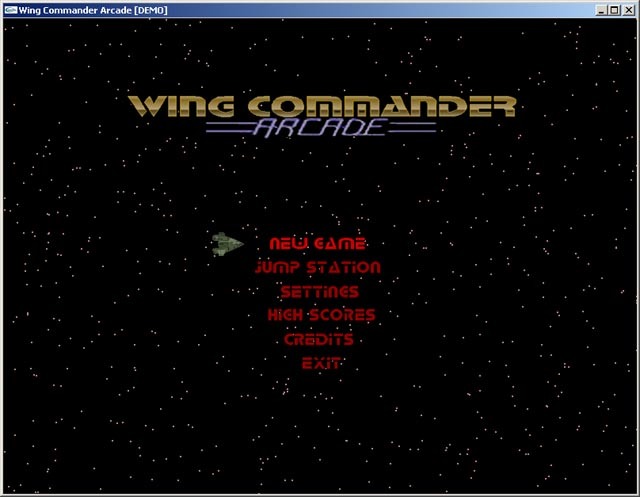 For a couple of months now, We’ve been working on a new Wing Commander related project: Wing Commander Arcade. 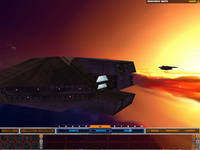 Even before the Wing Commander Arena announcements we had the idea to create a 2D Tyrian alike sidescroller situated in the Wing Commander universe. 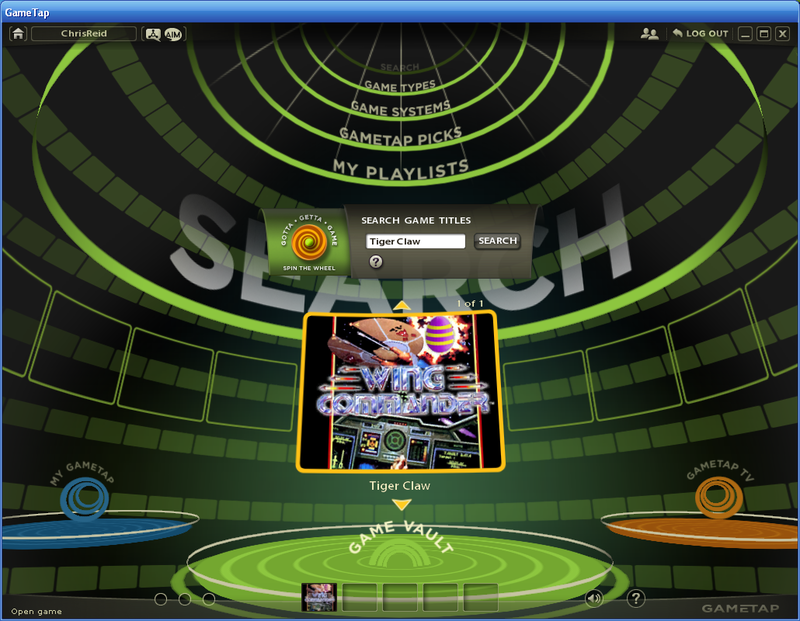 We decided to start from scratch in C using just the OpenGL and FMOD (for sound/music) libraries. 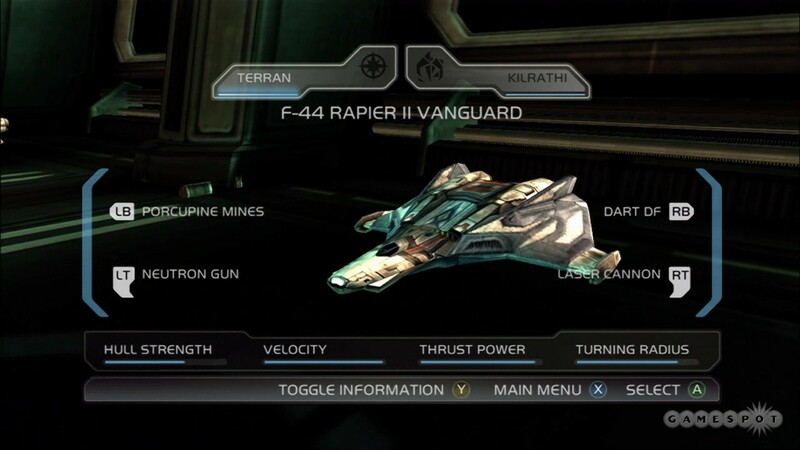 Most textures used in the game are derived from resources found in the CIC archives. 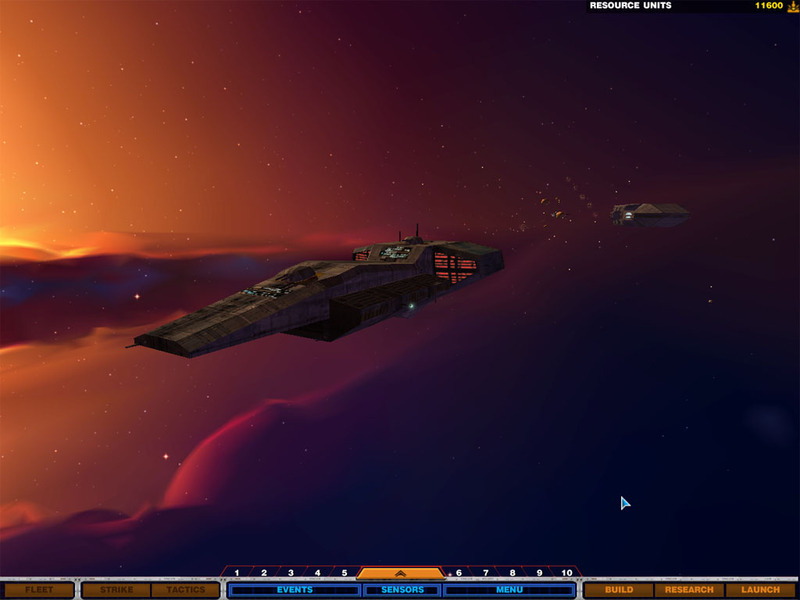 We are thrilled to announce that a playable demo is already available for download. 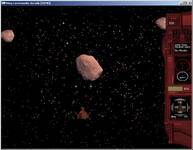 From the Wing Commander Arcade section of our homepage, screenshots can be viewed, two recorded in-game videos can be downloaded and, of course, the playable demo for the Windows platform can be grabbed. 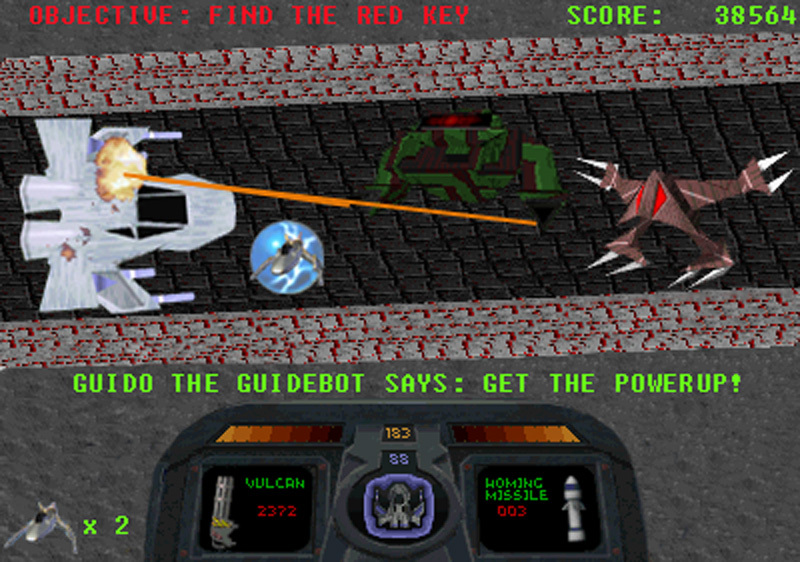 The first stage of the game can be played where the player can start flying the Arrow, Hellcat V or Longbow and navigate through an asteroid field. 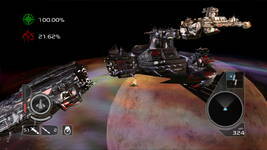 In the second part of the stage you will encounter some Kilrathi resistance. 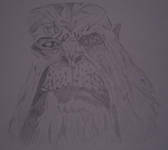 Any comments, questions or bugreports are welcome. 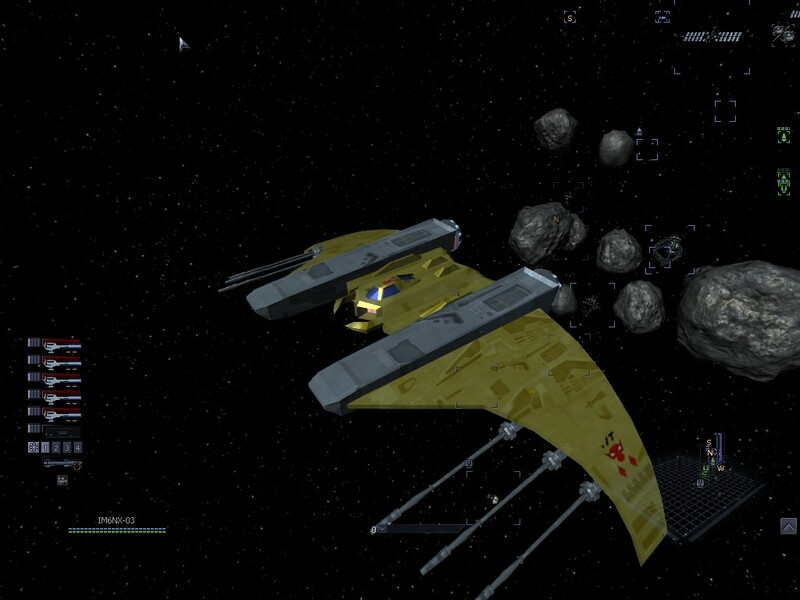 We hope the Wing Commander community will enjoy this playable demo. We keep you informed about the progress of the development of this game. 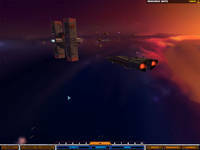 You can download the playable demo here (1.8 mb), and the sample movies are available here (5.7 mb) and here (8 mb). It looks like a lot of fun! Dreary Tuesday got you down? 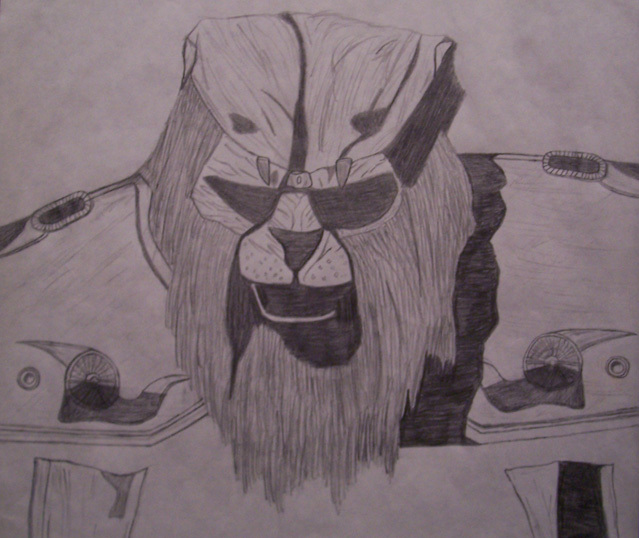 Brighten your day with a touch of fan art! 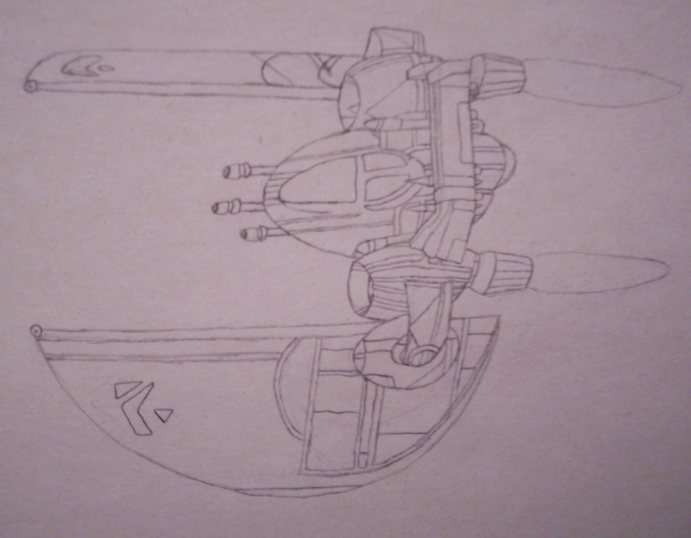 Here are two Wing Commander sketches from artist (and forum poster) QualPilot - a Kilathi warrior and a Border Worlds Banshee fighter. The Banshee, which is an older drawing, is especially cool! 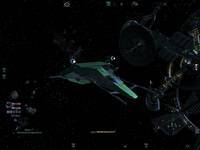 Howard Day has released four more 3D fly-around movies for WC Pioneer. 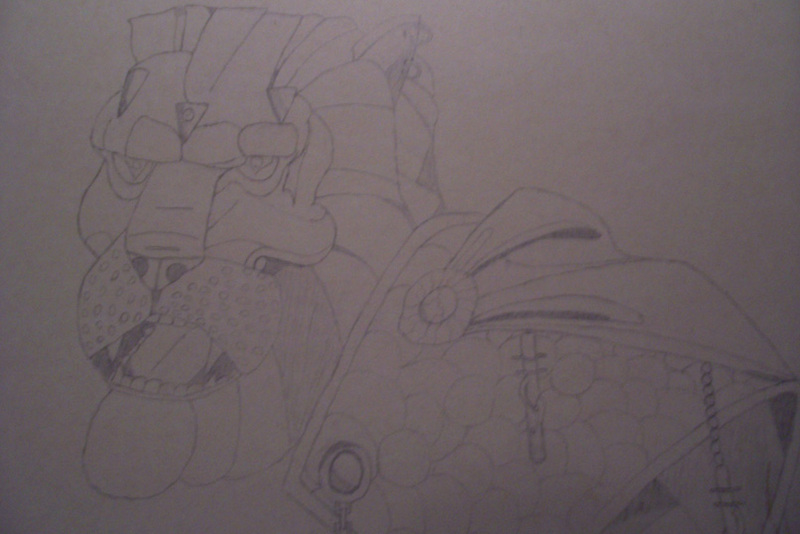 The classic Jalthi is followed by Howard's Phalanx and Camel designs. 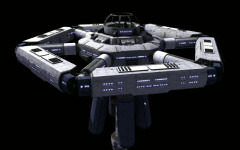 One of the fancy modular stations is also included in this batch. 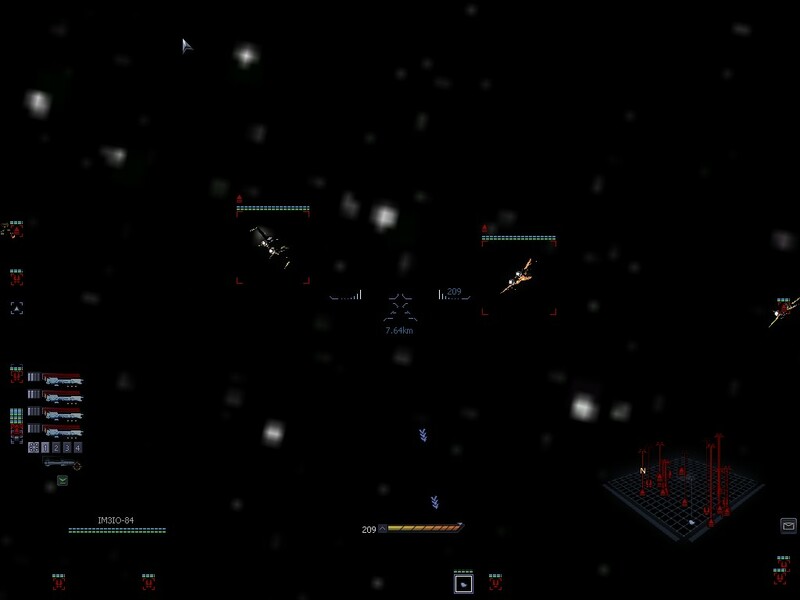 They're all QuickTime clips that were originally manipulated in XNormal. Each one looks pretty neat, but I'm especially impressed with the Jalthi. 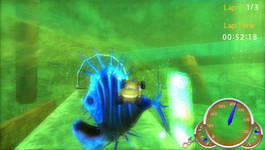 You can find the same treatment for Privateer's Tarsus and Pioneer's Hydra here. 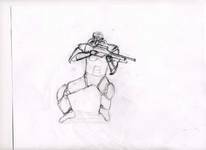 The new video links are below. 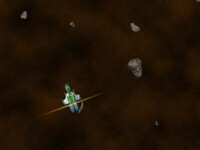 Anyhow - Each ship is using a combination of 5 different maps, all at a resolution of 1024x1024. These are palletized and compressed as much as possible, to keep the memory required low. 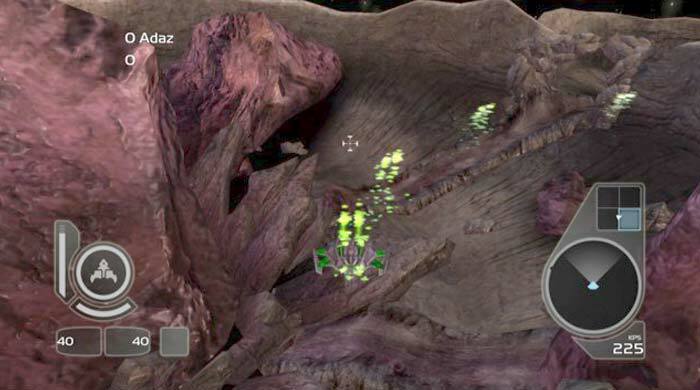 For example, the Phalanx only uses 3MB of texture space. 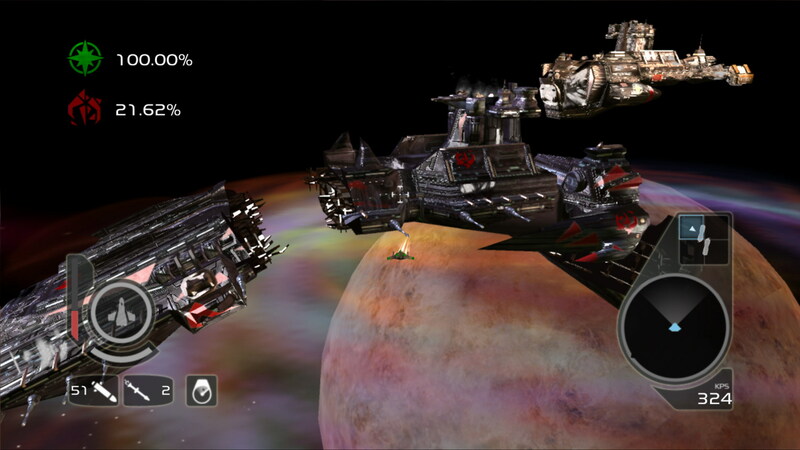 if these textures we not compressed and palletized, it would take closer to 12MB on the video card. This might not seem like much of a savings, but when we take into account that some players might only have a 64MB video card we see that we need to be as frugal as possible. This is especially important when the texture of the Camel come into play - they're 2048x2048. Uncompressed that's 64MB by itself! Compressed, they're only 6MB, so you can see why we're doing it. LeaderOne has put together a couple of comic strips based on Wing Commander 2. They're short, but cute and to the point. 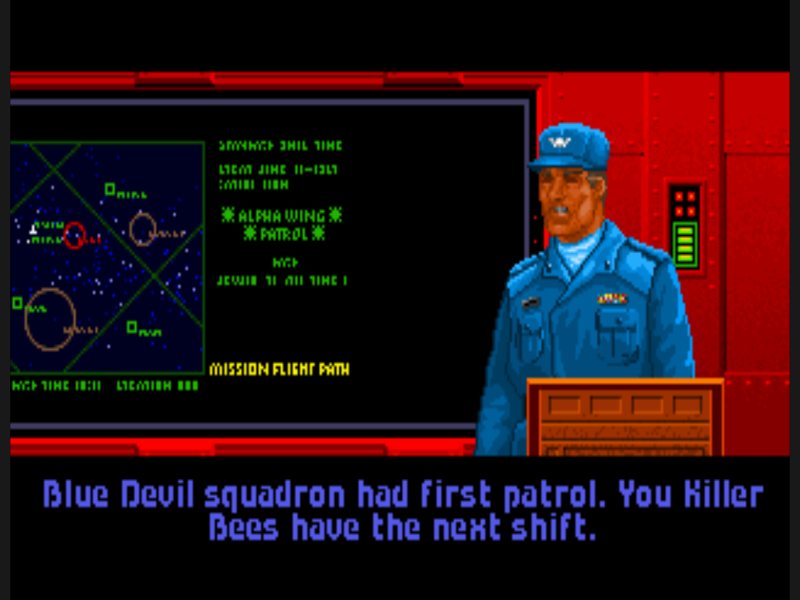 For creative Wingnuts who aspire to do something similar, screenshots are easy to get these days with DOSBox and a little PrintScreen work. 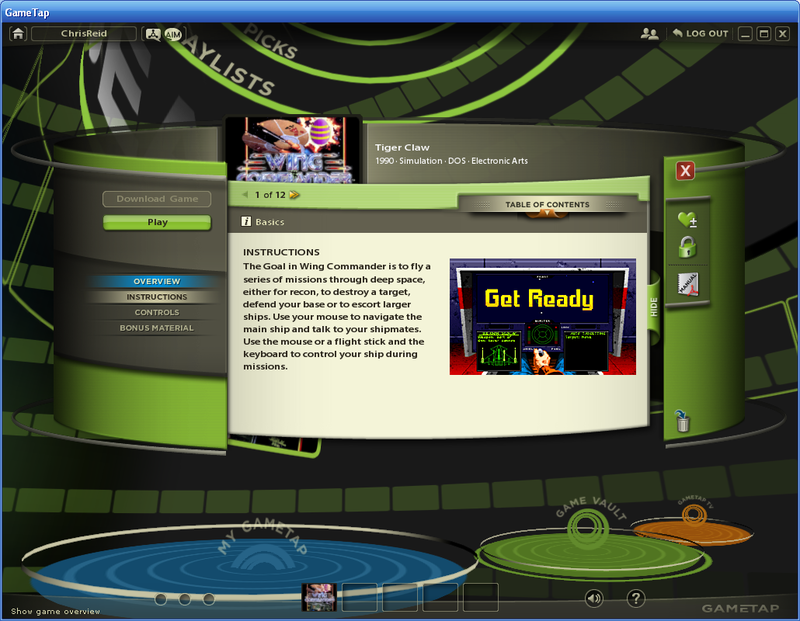 The newest version of the program even makes recording videos easy. I was bored... Let me know what you think. AD recently started a discussion about Wing Commander game manuals over at the EA Arcade Forums, and community manager James Pond has replied by hinting at some exciting news - something extra is in the works for Arena! There are no details about what form this will take, but it will probably be "in the style of Claw Marks" and available on the EA Arcade website. 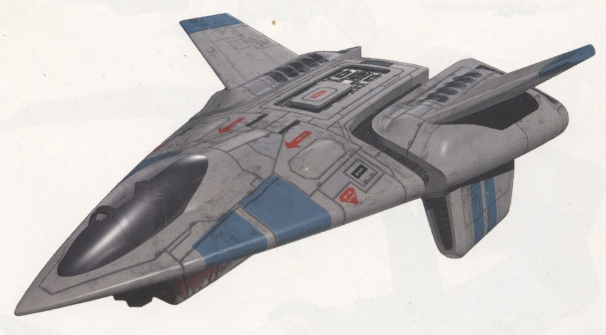 We are definitely aware that much of what makes the Wing Commander franchise great and memorable are the supplementary materials, subtle winks to past iterations of the game, and unique presentation of a "manual" in the style of claw marks, etc. I can assure you that there is something in the works, that will be available here and it's really faithful to the spirit and presentation of those materials you remember and love! This is more fantastic news for WC fans. 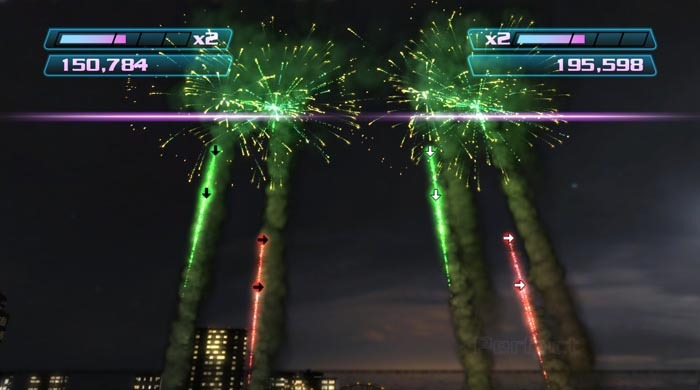 From Claw Marks to the Secret Ops website, the additional fiction available for previous games has been an important bonus component to the overall experience, and it's great to hear that this effort is being made here. 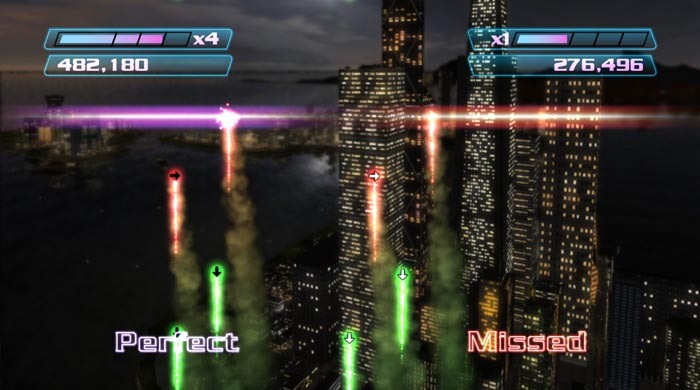 XBLA games traditionally have just a few pages of basic instructions in-game, so it seems that Arena continues to raise the bar in terms of what Live Arcade games have to offer. Today's new poll asks which upcoming Arena fighter you're anticipating the most. There will be three variants for each of the six main frames for a total of eighteen flyable craft. 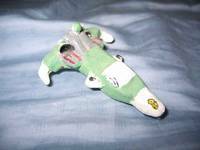 Each ship is a classic design from earlier in the series, so they should all have their fans. 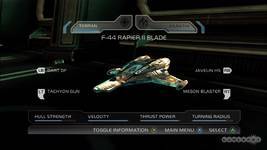 It'll be interesting to see how these results compare to the numbers after pilots have gotten a chance to play with each fighter. 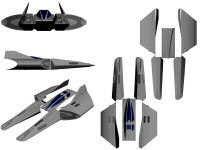 Check out our Arena Ships Preview to learn more about these famous designs. 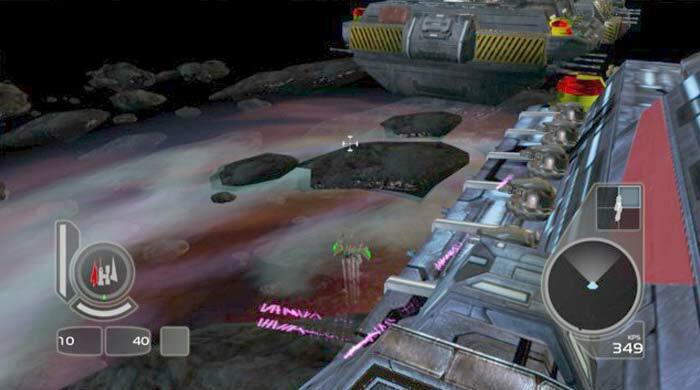 Our last poll asked which Arena feature was most exciting. Nostalgic Wingnuts swept the votes with "attention to WC history" in strong first place. 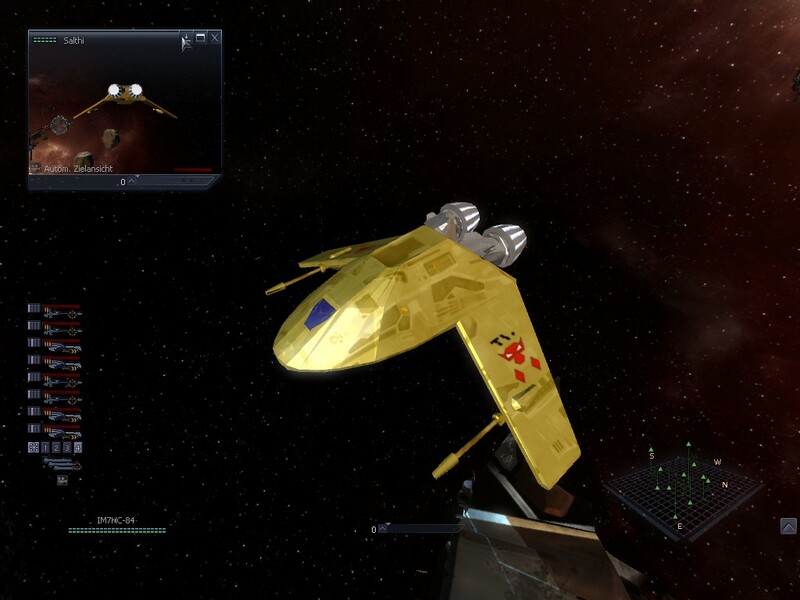 The "return of classic ships" came in second. 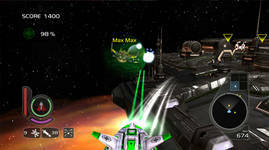 Exciting new features like sixteen person multiplayer and complex capship battles followed next. Either way, there's a whole lot to look forward to! 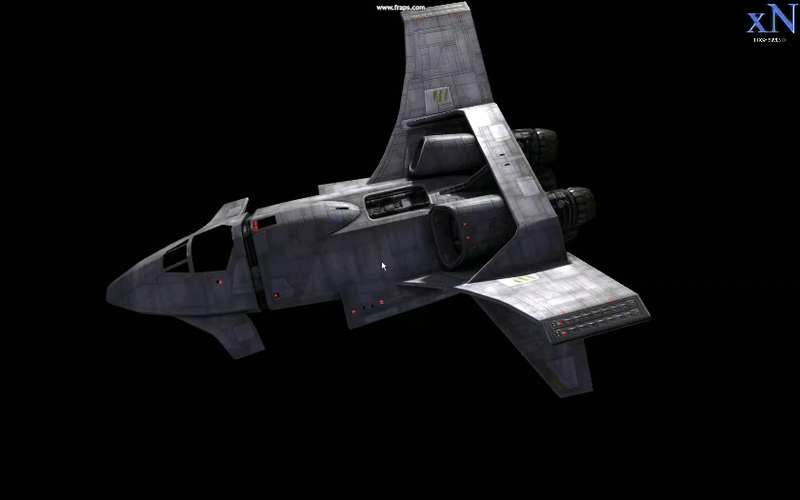 What kind of year will this be for Wing Commander? What is your favorite fighter? How long have you been visiting the CIC? 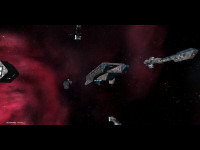 Today marks the first large-scale test of a new poll system, so let us know if you notice anything out of the ordinary. Also, if you have poll suggestions, we want to hear from you. 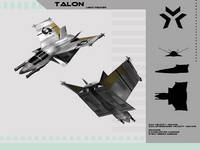 Raptor is proudly sticking to his target of one HTL chapter per month with this new release. GameSpot UK is reporting that EA Canada beat out Nintendo and Konami as the best selling game developer in the United Kingdom for the third consecutive year. 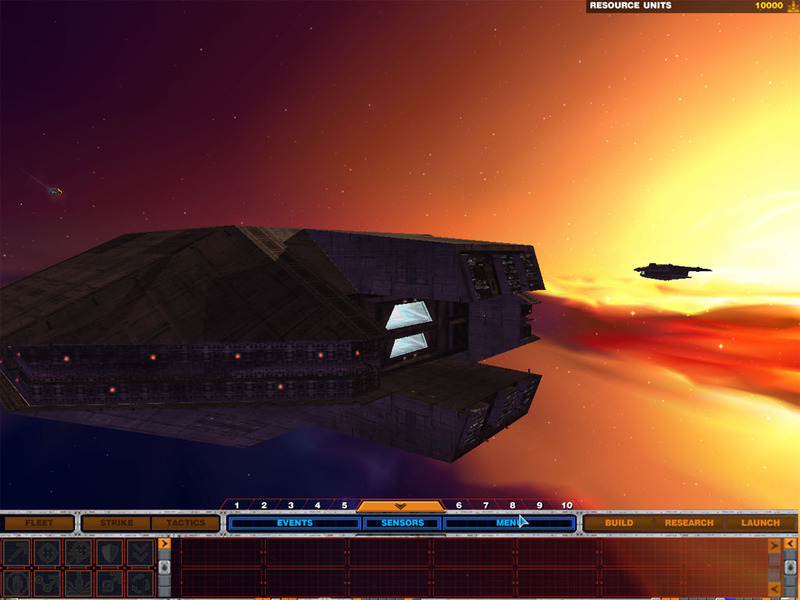 EA's Maxis and Redword Shores studios took fourth and ninth places in the territory as well. EA Canada is Electronic Arts' largest development studio and currently leads development for Wing Commander, Need for Speed, James Bond, FIFA, SSX and numerous other major franchises. 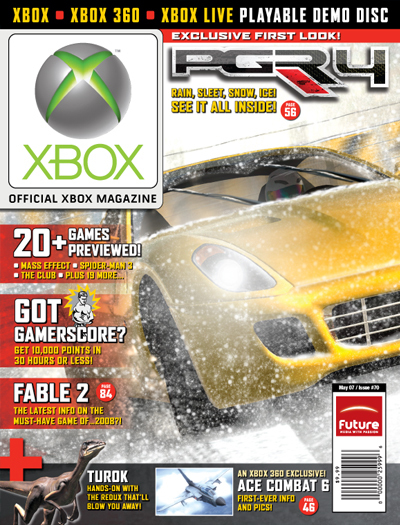 Their most recent NFS release, Carbon, sold more than eight million copies during the fourth quarter, and FIFA 07 has sold more than six million so far. The twenty-two acre site that they occupy in Vancouver has its own soccer field, indoor and outdoor basketball courts and a specialized motion-capture studio. Some two thousand people are currently employed there and they are continuing to expand. You can learn more here. 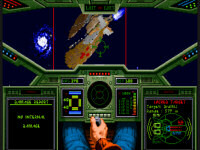 The Austin-American Statesman has an article of interest to would-be Wing Commander historians: Origin veterans Warren Spector, Richard Garriott and George "Fatman" Sanger are teaming up with the University of Texas' Center for American history to archive material relating to the history of game development! 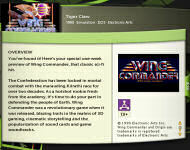 Composer Sanger, also known as "The Fat Man," will donate almost 30 boxes with items including his first demo cassette tape from 1983, in which he pleads with game companies to hire him. 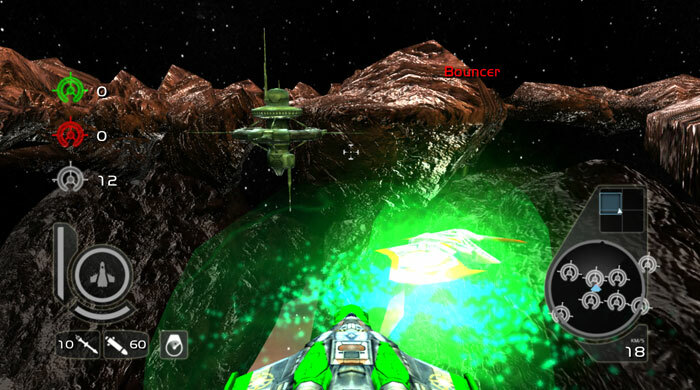 Sanger has composed songs for games such as the "Wing Commander" series and "NASCAR Racing." Sanger said he threw away several items the day he met with history center officials. "They told me, 'You put what in what? Take it out!' " Sanger said. He dug it out of the trash. 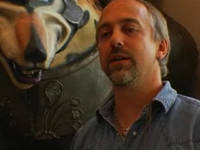 Garriott, the developer of the "Ultima" series, has been particularly meticulous in saving documents and memorabilia from his development career, dating back to 1979. 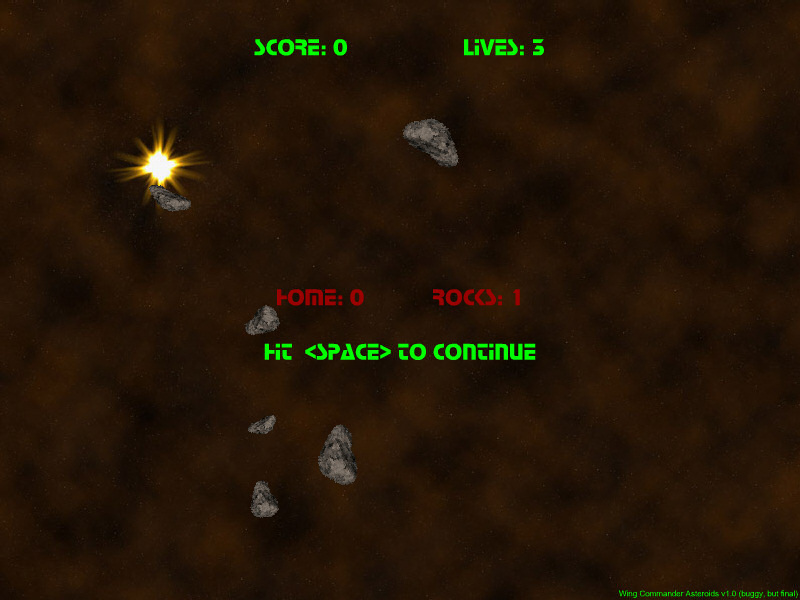 For every game he developed, he saved and labeled the first 10 copies. He will also donate several now-defunct Apple II computers and framed posters from every game he helped develop. 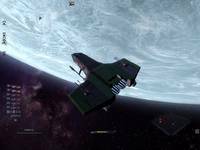 It's great to see this getting some professional attention. I've done research using UT's archives before and can say with confidence that this is the best possible way to both preserve and present this material. It's amazing to think that the original Wing Commander pitch document will now be kept alongside the likes of LBJ's White House papers and D.H. Lawrence's original manuscripts. 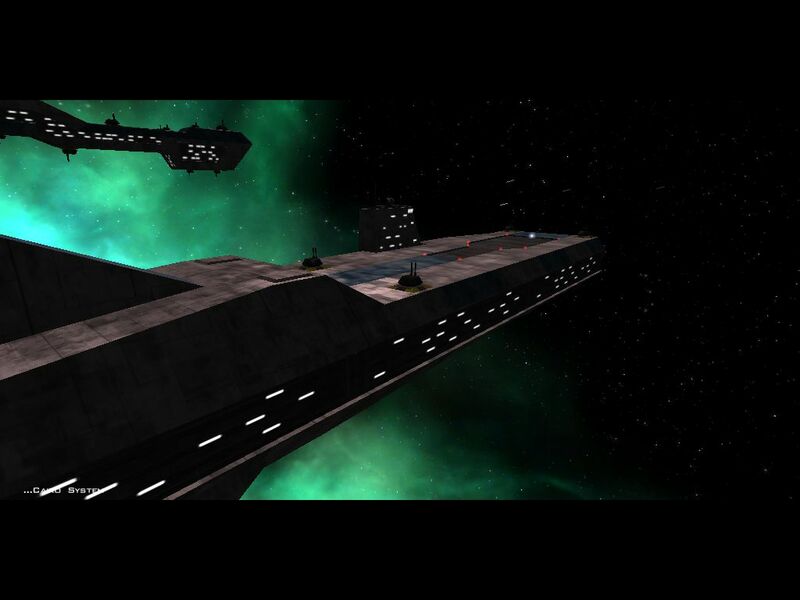 Mike-L has released the first screenshot for the online version of TacOps, Ironduke's neat WC2-themed tabletop game. 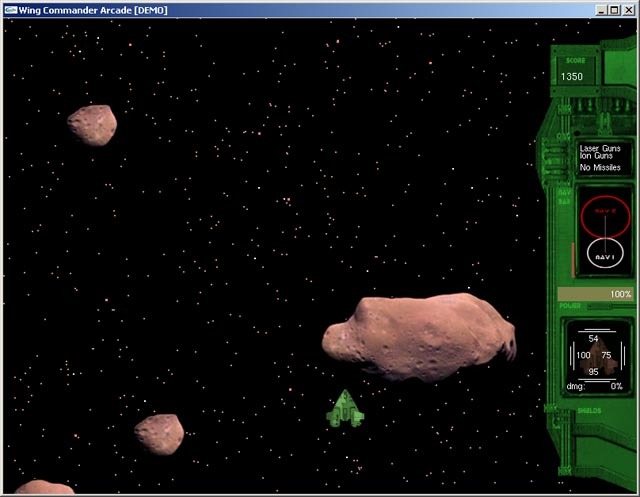 This C++ port is still in the preliminary stages, but a basic interface and virtual layout is visible below. 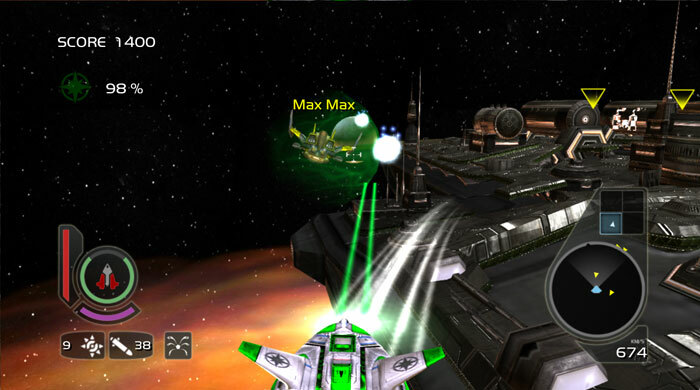 Units can be added, deleted and moved around now, and the game board can be manipulated. 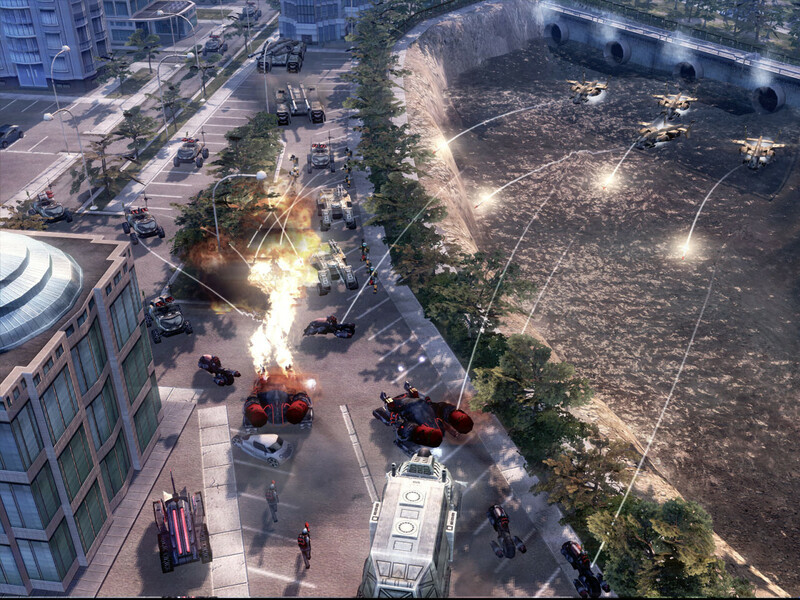 An AI isn't planned, but two players can hook up along to compete against each other or play custom scenarios. 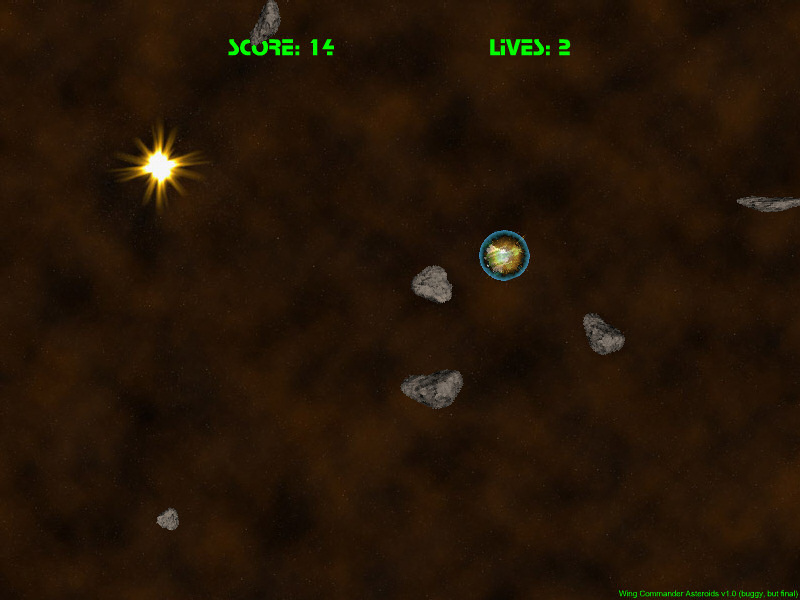 The map editor and basic game engine are also nearly complete. 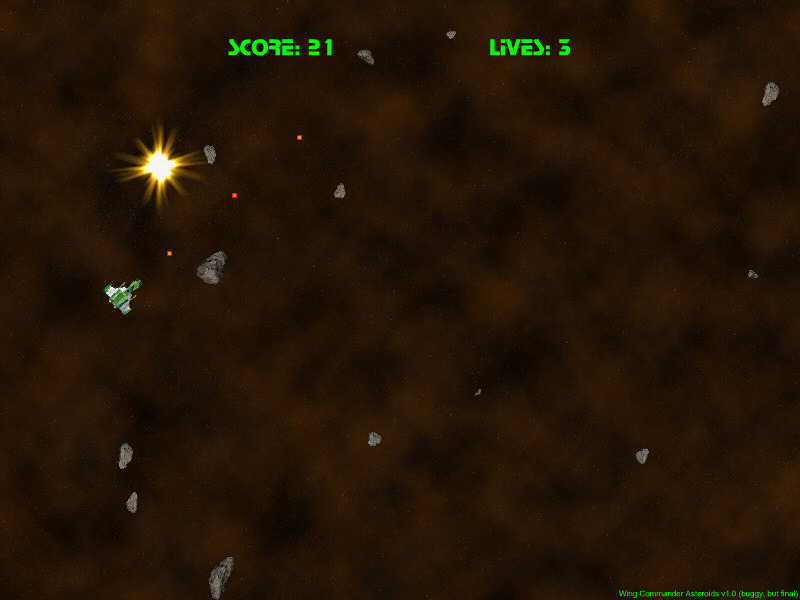 These elements will be releases as a basic tech demo when they're finished. 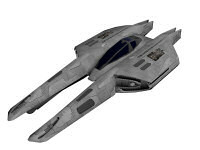 Try out the printed version of TacOps here or help provide feedback at Crius.net. 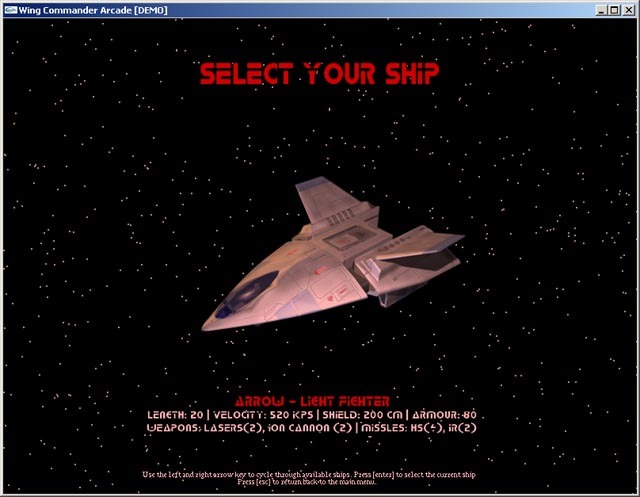 I'm using mingw32 C++ compiler (one that comes together with DevC++ IDE) and SDL library (Simple Directmedia Layer) for graphics/mouse/keyboard support. 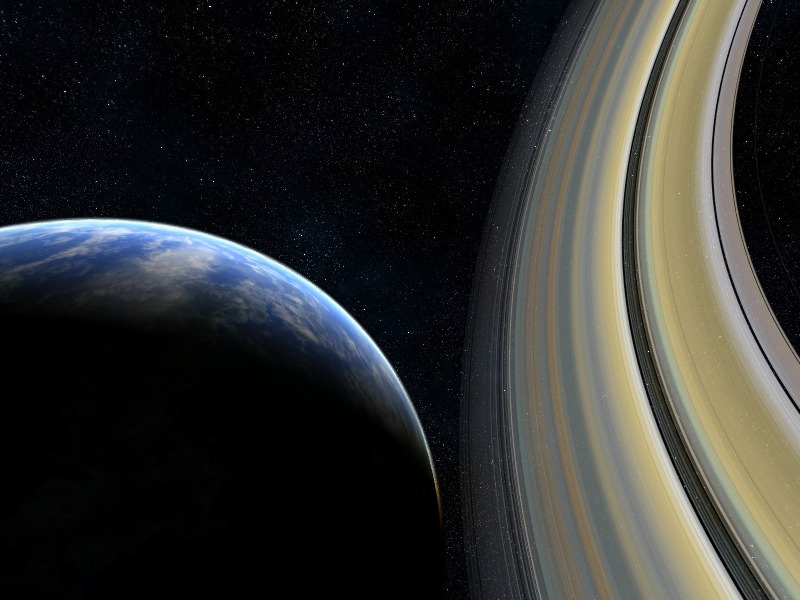 SDL might not be top-performance but it's rather simple to use and it does it's job well. 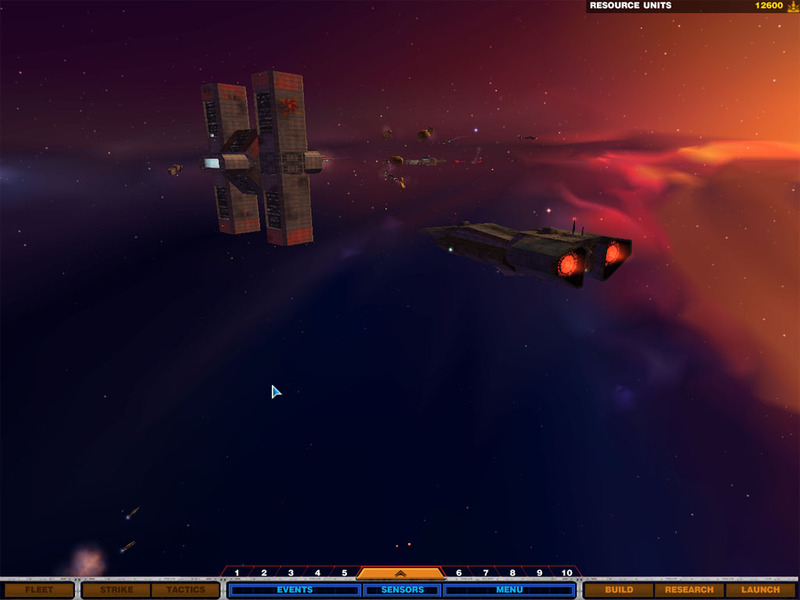 After all, running a 2D strategy game is not very demanding for the system. What is more it's a cross-system library so I'll be able to compile versions for Linux and MacOS as well. 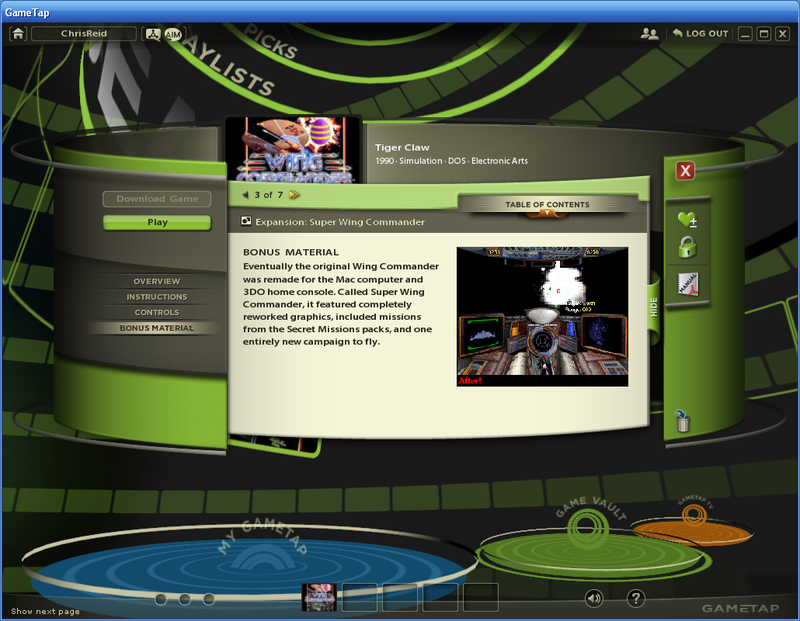 All GUI elements were made in a hurry and there are to be replaced. 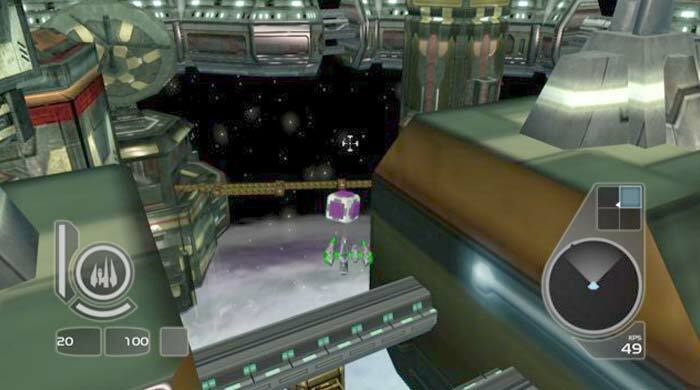 That box in right upper corner is a minimap. More info coming soon. The CIC staff and I would like to wish Ben "Bandit (LOAF)" Lesnick a happy 26th birthday! 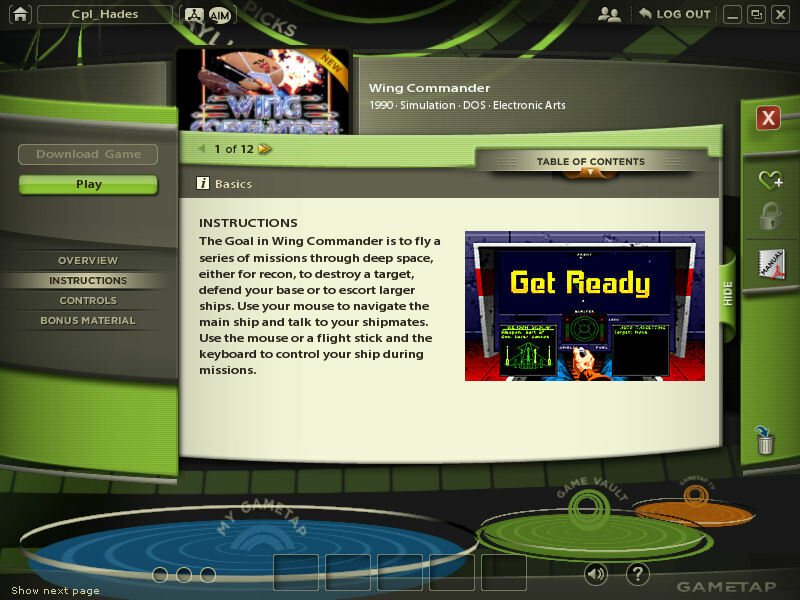 When someone needs to seek out a Wing Commander expert, LOAF is at the very top of everyone's list. 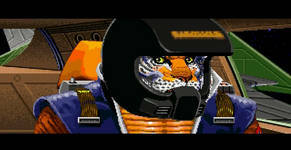 He's been a part of the online Wing Commander community for almost fifteen years, and nobody else has shared more knowledge and excitement with fellow fans. 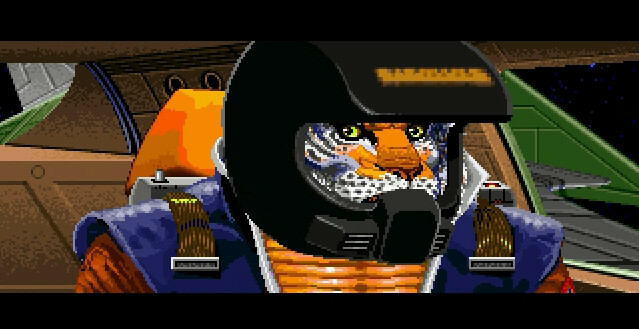 This year is no different in that regard, and every day LOAF is busy pumping people up and preparing for the upcoming launch of Wing Commander Arena. Join us and wish him a great day! It's a Movie! It's a Text File! It's Both! 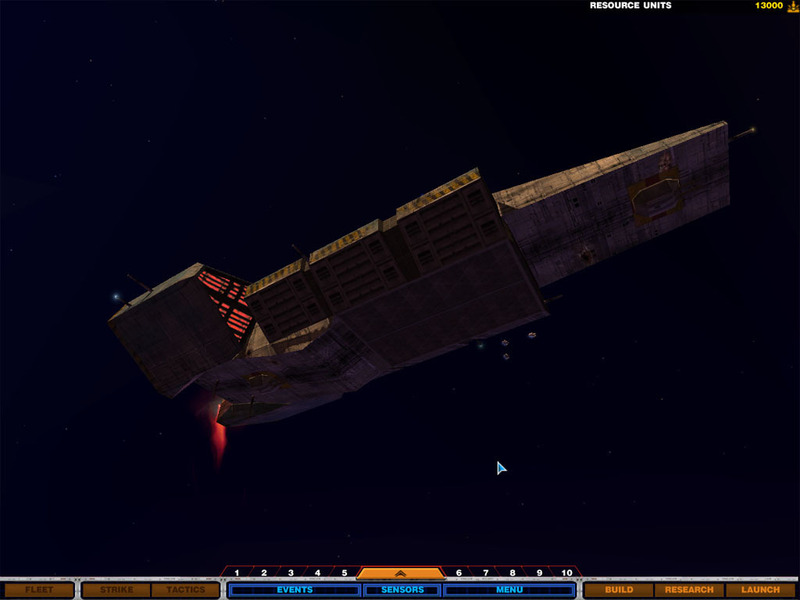 Chris Knudsen has updated with another cool feature from his Privateer: Ascii Sector project. 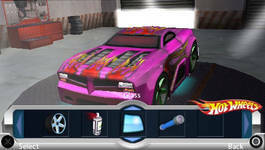 The game can now record text-based movies... and he has released a movie player so people can share the action. 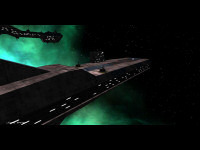 More immediately, he's posted a movie playing through a 'Defend the Base' mission... so you can see that this surprising project actually works like the original Privateer! You can download the movie player here (1.4 mb) and the demo movie here (1.4 mb). 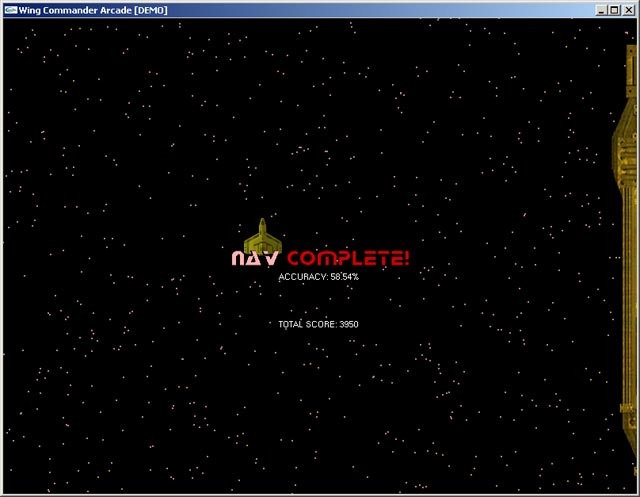 Just run PLAYASC.BAT and follow the on screen instructions! 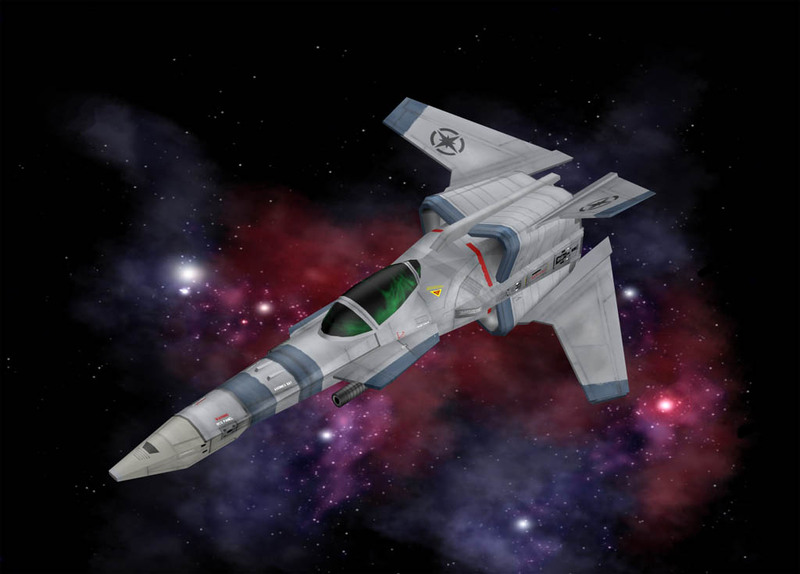 In yesterday's interview update I mentioned putting together an article about the history of 'lost' Wing Commander novels... and now it's available! 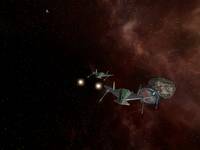 This short article collects information which has been sitting around in our archive for a while, in the hopes that it will help some future publisher continue the novel series where it left off. It runs through the history of the HarperCollins' movie novels, Andrew Keith's False Colors concepts and a couple of other unexplored possibilities. You can read it here. In retrospect, the writing was on the wall: despite a contract which promised to publish both books within a year of the movie's release, HarperCollins delayed Stars' publication by months. When the book finally did reach stores in 2000, it did so without even new cover art. 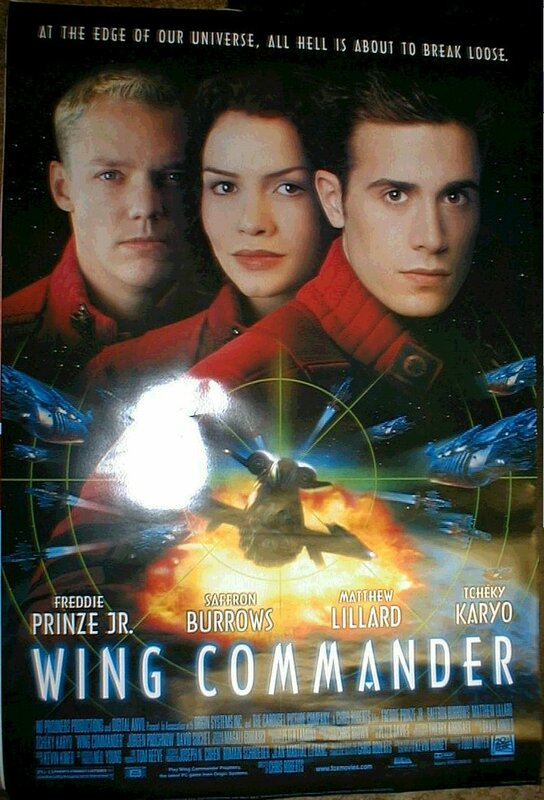 Instead Wing Commander's theatrical poster was re-used, advertised alongside largely nonsensical advertising copy. 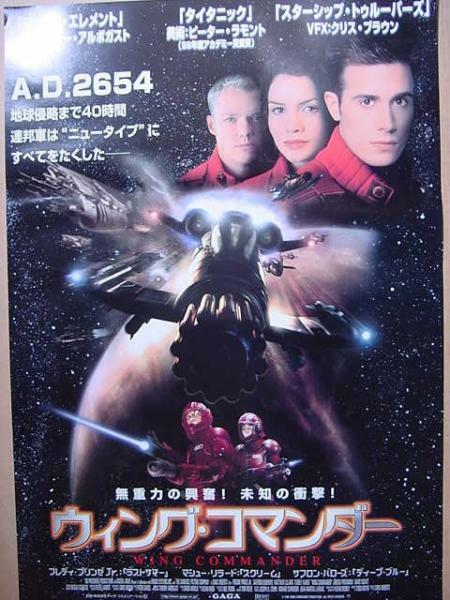 The HarperPrism imprint, responsible for the series, was quietly disbanded. Although Telep completed Pilgrim Truth the book was never scheduled for release. 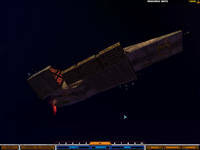 Worst of all, Stars ended in a cliffhanger: Paladin was missing and thought a traitor, the Confederation still threatened by Captain Aristee and her doomsday weapon. 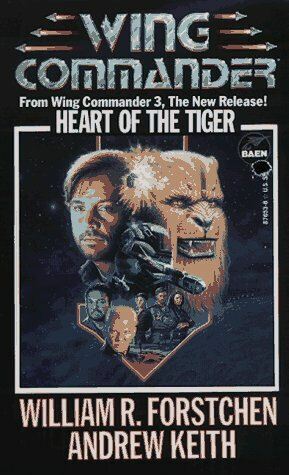 I was putting together a short article on 'lost' Wing Commander novels last night when I made an unpleasant discovery: the original interview we did with Andrew Keith, co-author of Heart of the Tiger and False Colors, was missing. 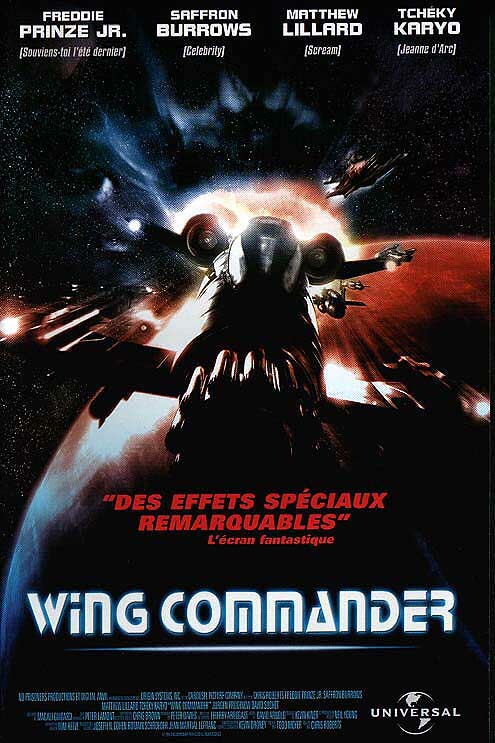 The interview, conducted in 1996, was one of my favorite projects for our immediate predecessor, the Wing Commander Home Sector. 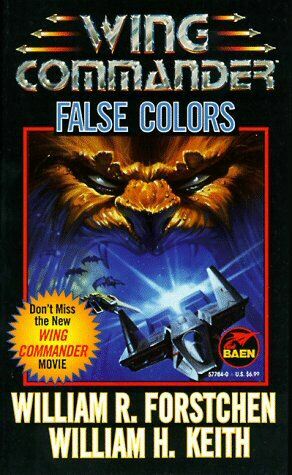 It discusses how Wing Commander novels are written and provided the first details on the then-upcoming False Colors. 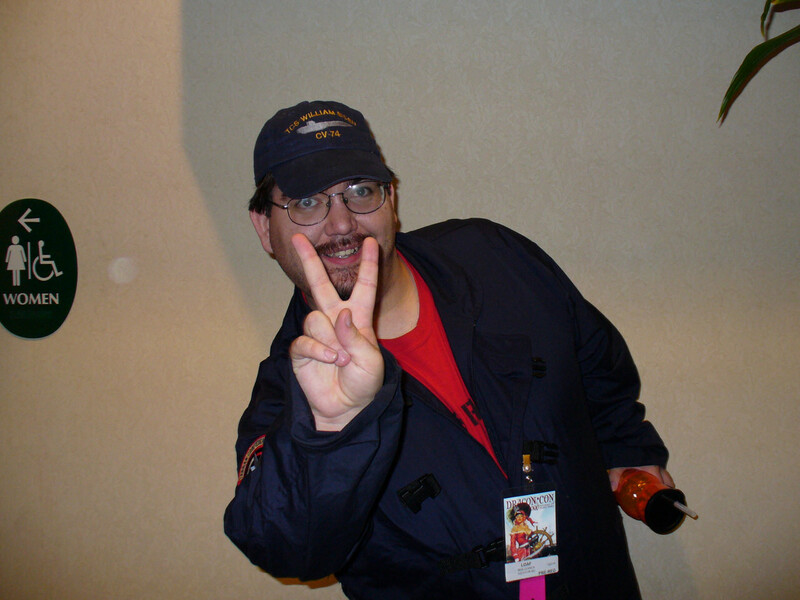 Most importantly, it briefly outlines Mr. Keith's hopes for two sequel stories. 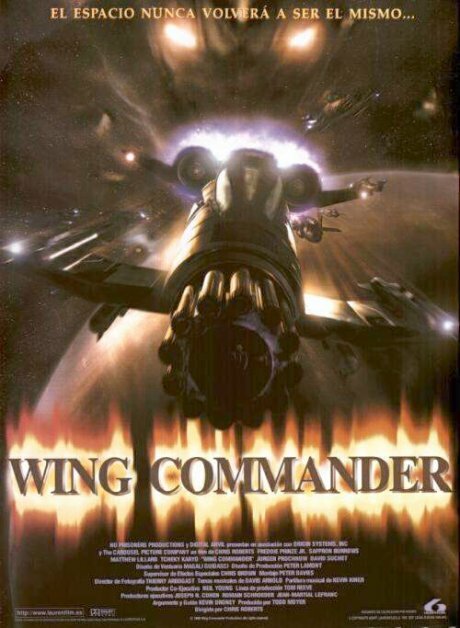 Mr. Keith died in August 1999, these books unwritten - but his kindness to the Wing Commander community will never be forgotten. 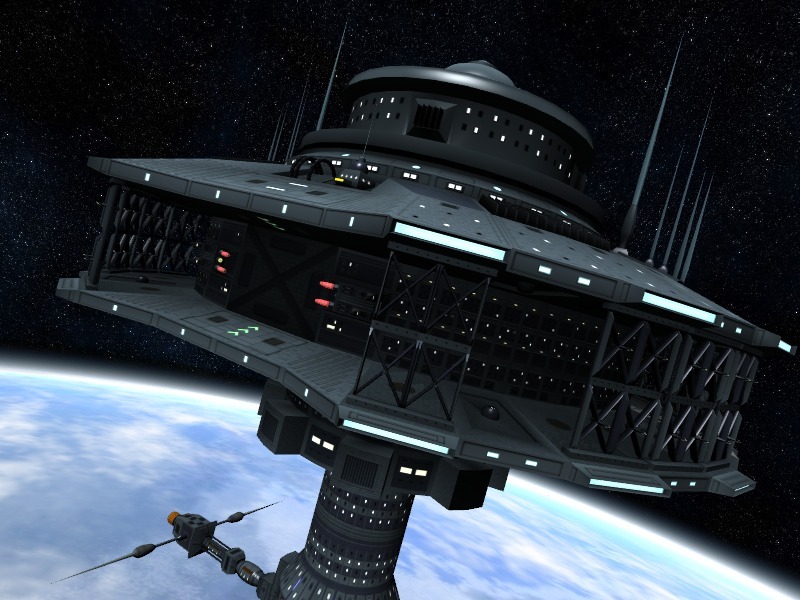 Luckily, we were able to locate the original IRC log of the event and then put it back together from there! Please be kind when reviewing the questions... I was only fifteen (and completely star-struck) when I held this interview. You can read it, preserved forever online, here. Keith: The book ideas are still vague. 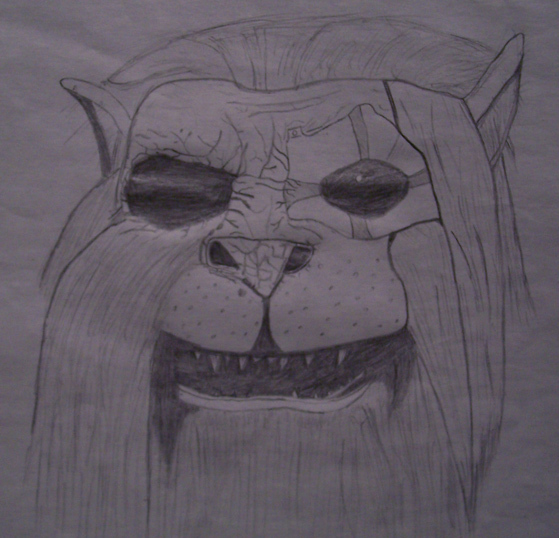 One I'd like to do would involve a Kilrathi prince -- a friendly one -- from False Colors. Sort of Bonnie Prince Charles in Scotland, with Cats and carrier support by the Karga. The other would put the Landreich at war with the Confederation. I'm thinking of following something like the Alamo/Goliad/San Jacinto model. 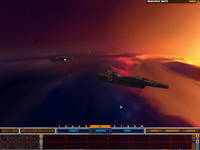 Deacan has released another update to his fancy Straith touch-up. 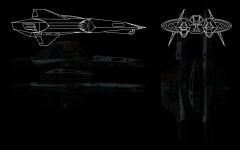 The set of images below starts with Jacob Hudson's conceptual outline and artistic top-down redesign. A handful of his custom Brute Missiles are flanking the fighter in the second shot. 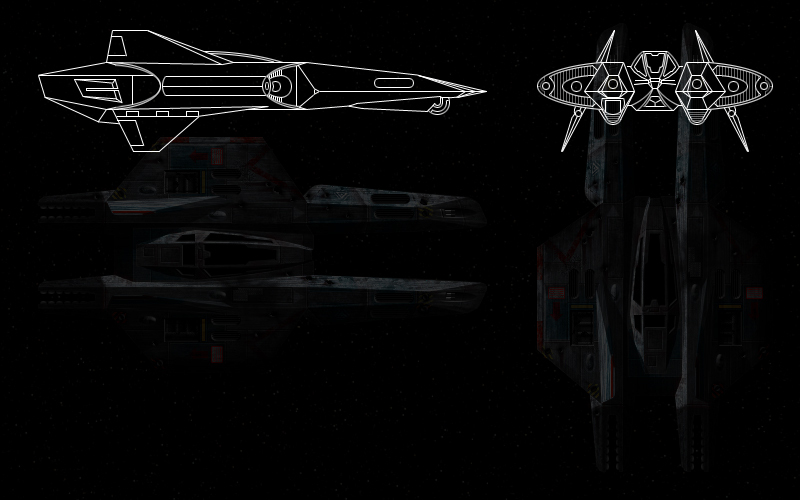 Ser Kears is also continuing to make progress on a more intricately modeled and textured 3D version. These latest high resolution shots show how the team has captured many of the original ship's details while attempting to add some nice new polish. 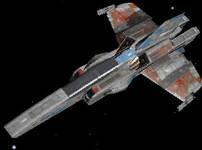 The Straith is the cheapest fighter available on the private market in the Tri-System. 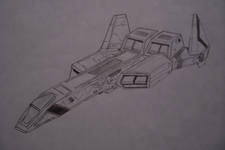 Because of its low cost, Straiths are flown only by the most desperate of men - those generally willing to do anything for a quick credit. 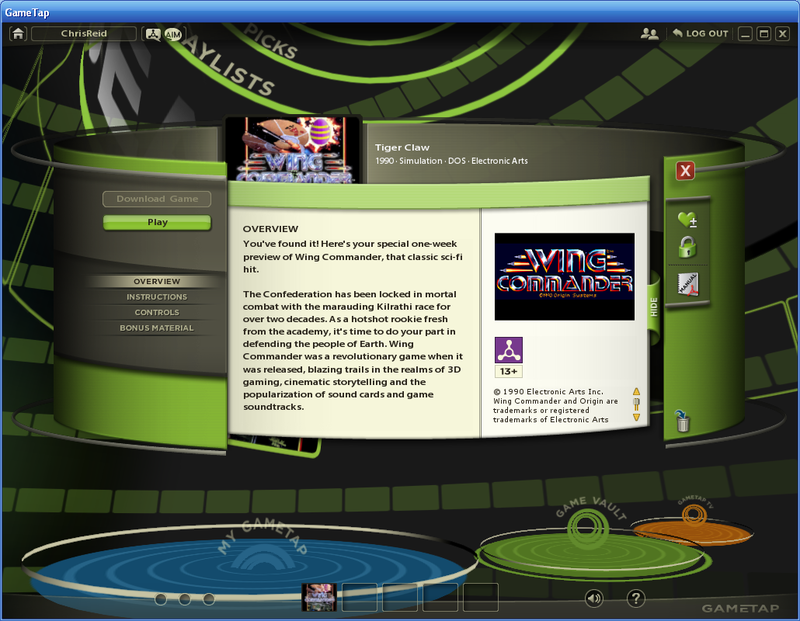 You can find the site's original eight screenshots archived in our Wing Commander Arena section. 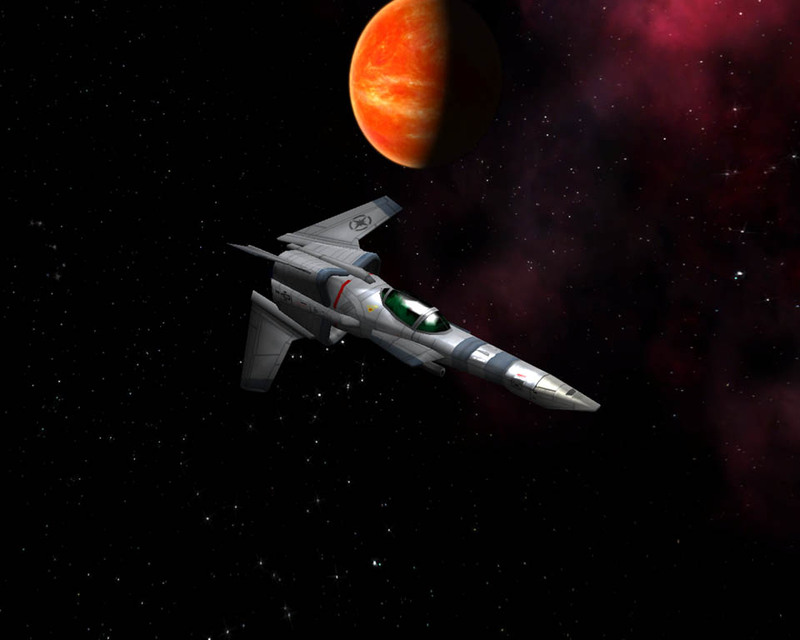 I've completed a basic structure for the non-plot missions and their descriptions in the nav computer. 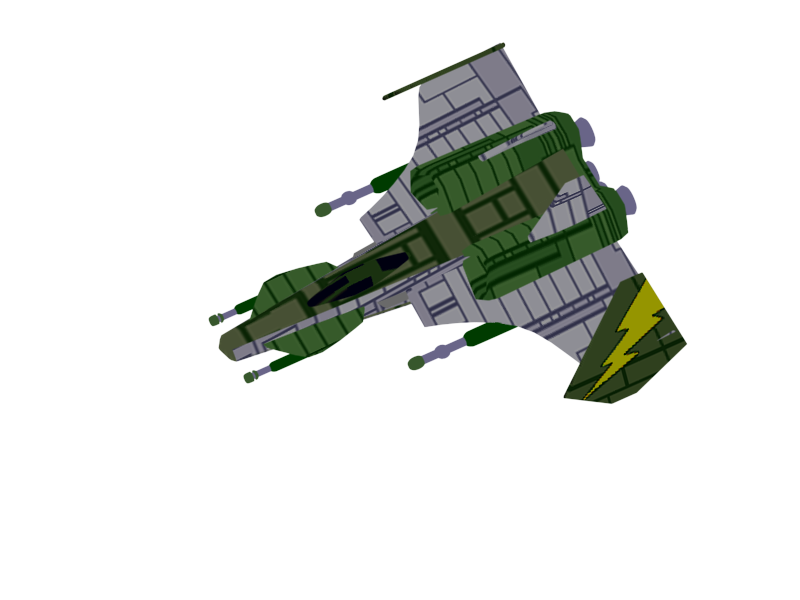 In the below examples all the ship names have been made up by me (as you can probably guess by the mention of the Millennium Falcon! 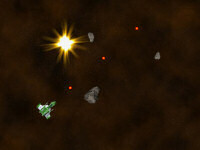 ), whereas all the names of characters have been randomly generated by the game engine. 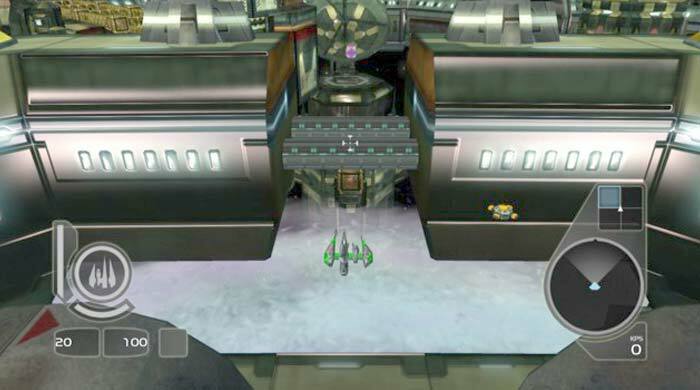 Also, in the below examples, Guamao is mentioned as a prison base -- it won't be a prison base, as there won't be any in the game demo. 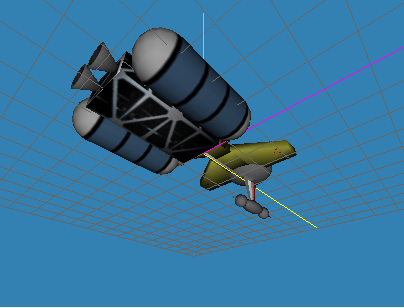 I've just designated it as such for testing the non-plot mission structure. 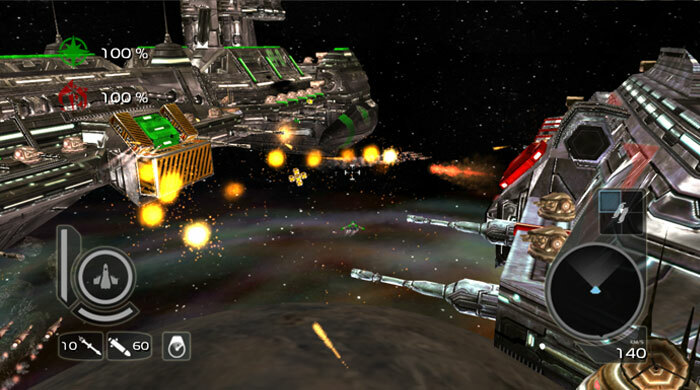 As new titles continue to join GameTap’s catalog of more than 850 console, arcade and computer video games, this week’s GameTap Thursday alert touts the latest additions, including the critically acclaimed Wing Commander and Warlords Battlecry III, as well as the network’s first SEGA Saturn title. 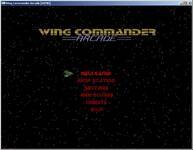 Wing Commander: Electronic Arts’ sci-fi strategy game enlists players in an outer space aerial war to defend Earth from the marauding Kilrathi race. 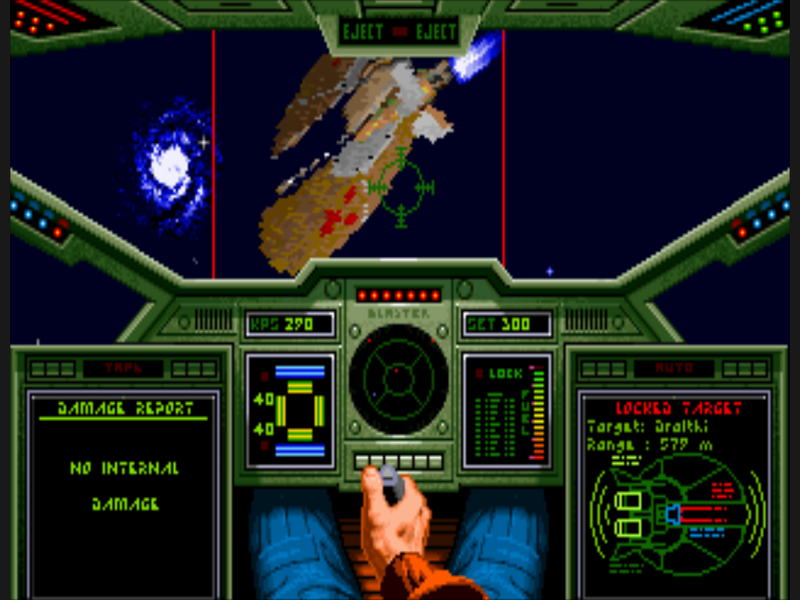 Wing Commander was a revolutionary game when it was released, blazing trails in the realms of 3D gaming, cinematic storytelling and the popularization of sound cards and game soundtracks, so check out the game that started it all! Warlords Battlecry III: This real time strategy game from Enlight Interactive Inc. further expands the Battlecry tradition of featuring persistent RPG-like fantasy heroes with its retinue of loyal followers fighting massive battles in the Warlords' world of Etheria. 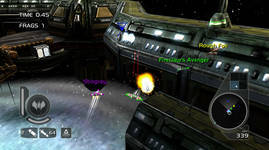 As a true sequel to Warlords Battlecry I & II - both of which are also available on GameTap - it features many familiar races and troop-types, while also adding new ones into the mix. Bug! : Originally appearing on GameTap last week in the form of an “Easter Egg,” this SEGA action title ushers in GameTap’s latest console – the SEGA Saturn. Bug is a big movie star whose film set friends are kidnapped, so he’s off to save the day in a hopping-and-bopping platform-jumping adventure. 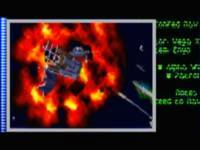 With some of the greatest Saturn titles on the horizon, this is big news for fans of classic console gaming. Doki Doki Penguin Land: GameTap unveils SEGA’s Doki Doki Penguin Land, its latest addition to its library of games for the rare SG-1000 Japanese-only 8-bit console. As a penguin in the harsh arctic wasteland, it's your job to outsmart the burly polar bears and roll your egg to the safety of your underground home. ThinkTanks: GarageGames’ ThinkTanks is a fast-paced tank combat game where only the smartest tanks survive in a deadly arena. 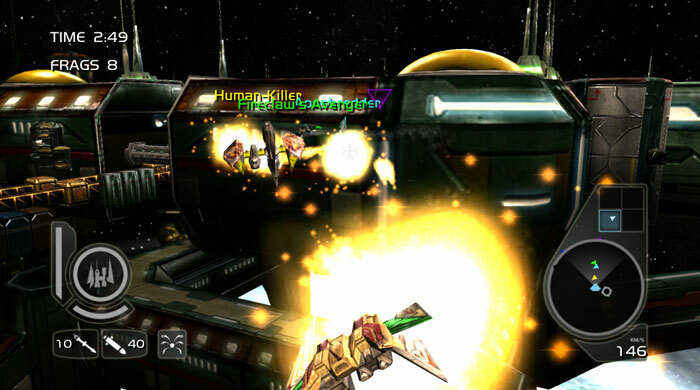 The backstory is that the Terranians have been harvesting human brains and popping them into armored vehicles, all to create a game show where these captive Think Tanks do battle for the amusement of wicked alien overlords. 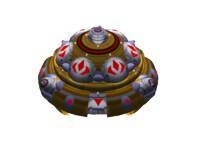 You're one of the Think Tanks, but you've escaped! 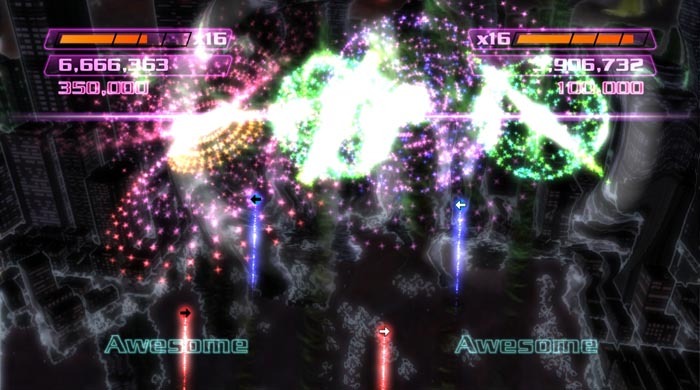 Now it's up to you to free your fellow brains and destroy the enemy. 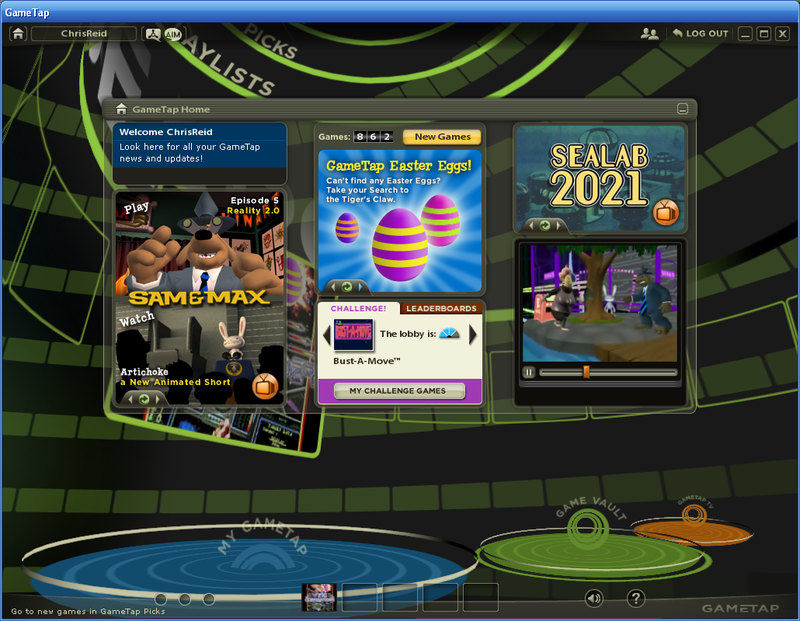 In addition to 850+ games, GameTap provides subscribers with unlimited access to more than 600 original TV shows and videos that cater to fans of the video game lifestyle. 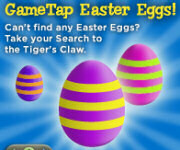 It's not just an Easter Egg anymore! 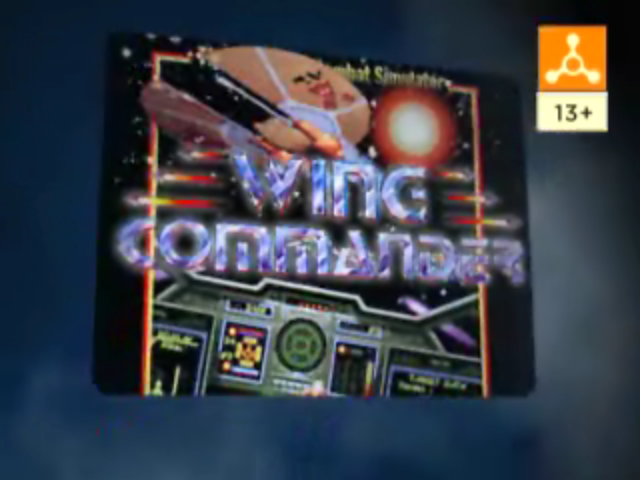 GameTap has added Wing Commander to its library of games. 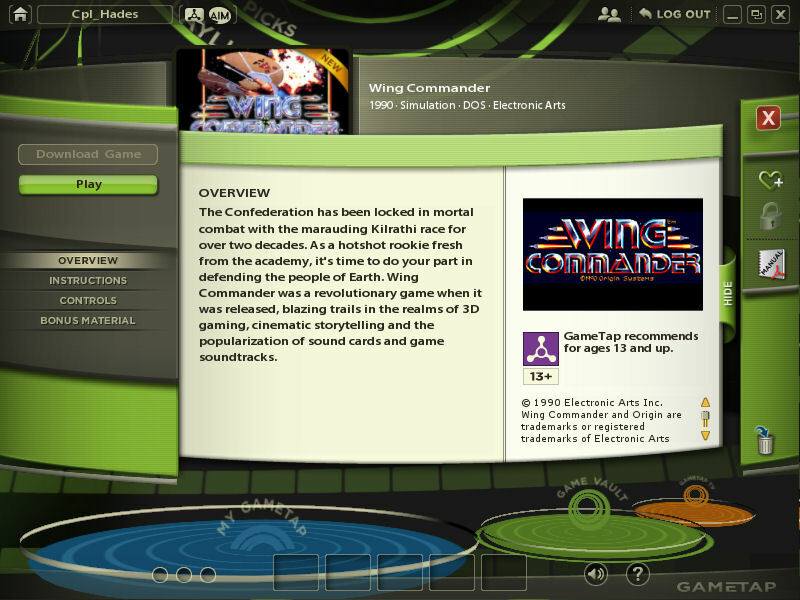 You can see it online here or access it through the GameTap client by searching for "Wing Commander"! This is a great, cost effective way to play one of the greatest games of all time... and hopefully, there's more to come! The Confederation has been locked in mortal combat with the marauding Kilrathi race for over two decades. 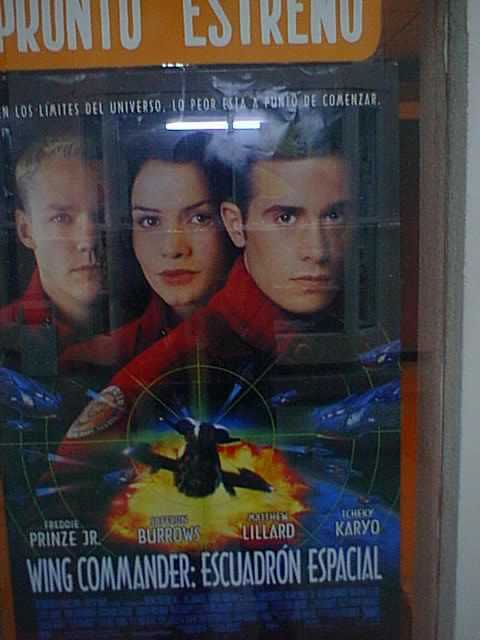 As a hotshot rookie fresh from the academy, it's time to do your part in defending the people of Earth. 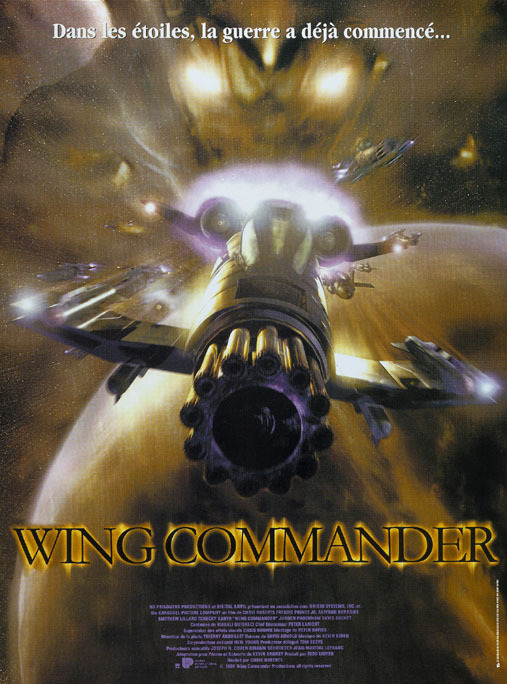 Wing Commander was a revolutionary game when it was released, blazing trails in the realms of 3D gaming, cinematic storytelling and the popularization of sound cards and game soundtracks. It also looks like Electronic Arts has also officially launched their EA Arcade website... news stories have been slowly popping up at sites like Gaming Nexus and Gaming Bits. 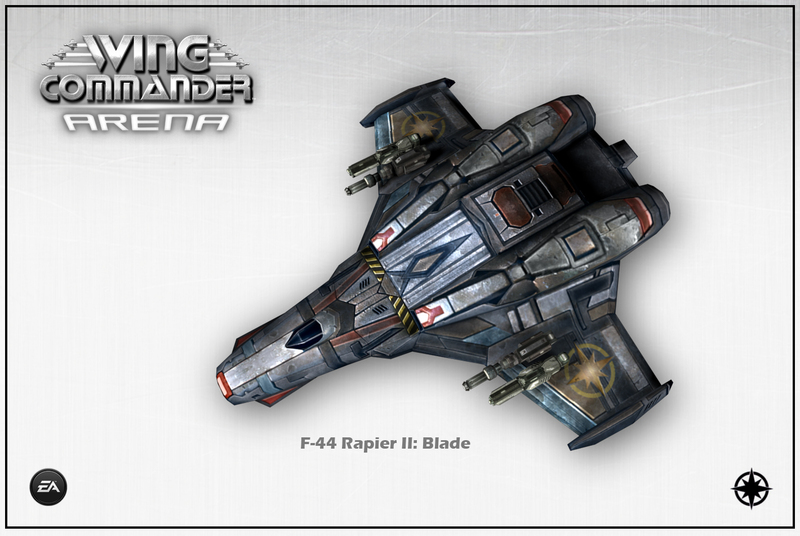 This is good news for those of us impatiently reloading the site for more information about Wing Commander Arena. 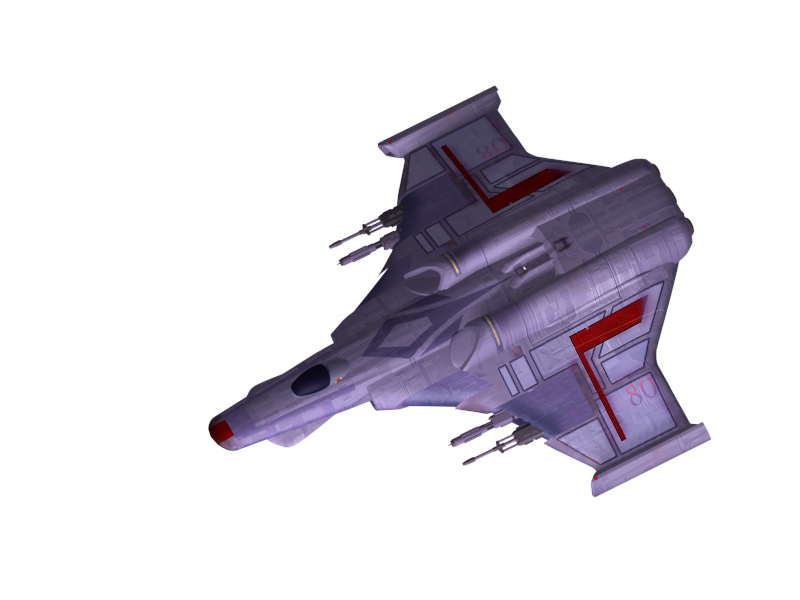 Be sure and head over to their Wing Commander Arena forum -- posting there will help EA see how much interest there is in Wing Commander... as well as show them that WingNuts are the best fans in the world! 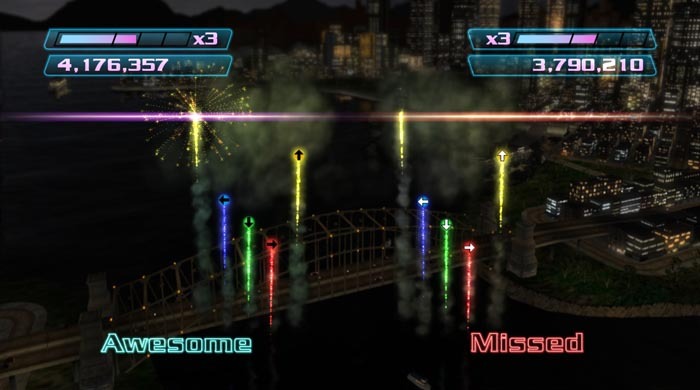 New Xbox Live Arcade titles are released on Wednesdays, and this week's offering is Boom Boom Rocket! 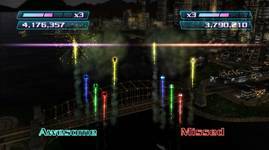 The music rhythm game is Electronic Arts' first XBLA title and costs 800 Microsoft Points ($10). This is exciting news for us, because the next game for the EA Arcade will be Wing Commander Arena! 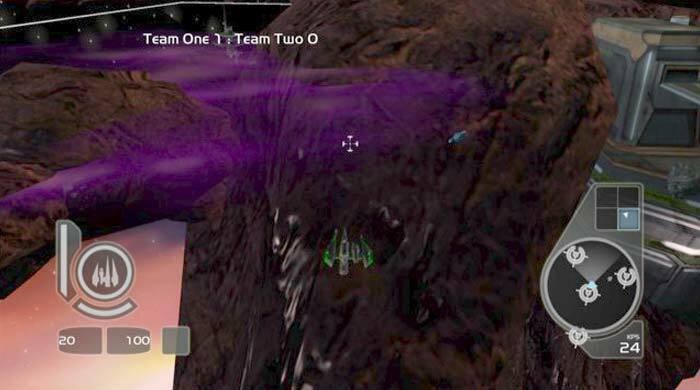 Since EA needs to coordinate with Microsoft in rolling out XBLA titles, we don't yet have a specific release date for Arena. 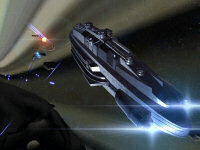 The original press release said the game is scheduled to come out this Summer. 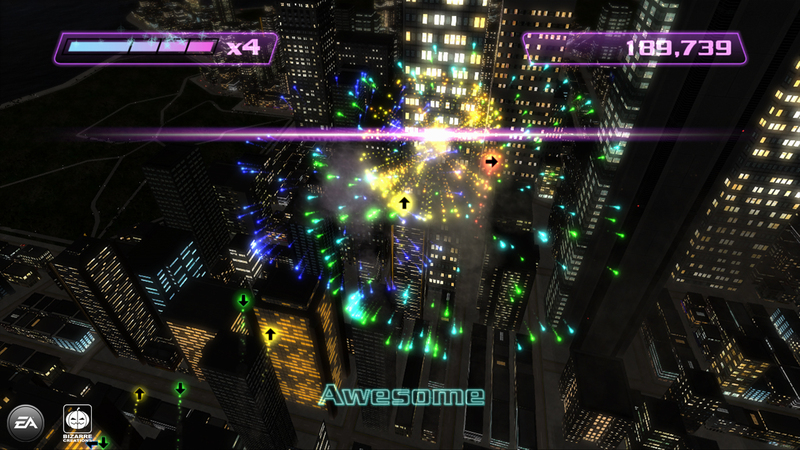 In Boom Boom Rocket, players trigger rockets to the beat of the music while traveling through a 3D cityscape. 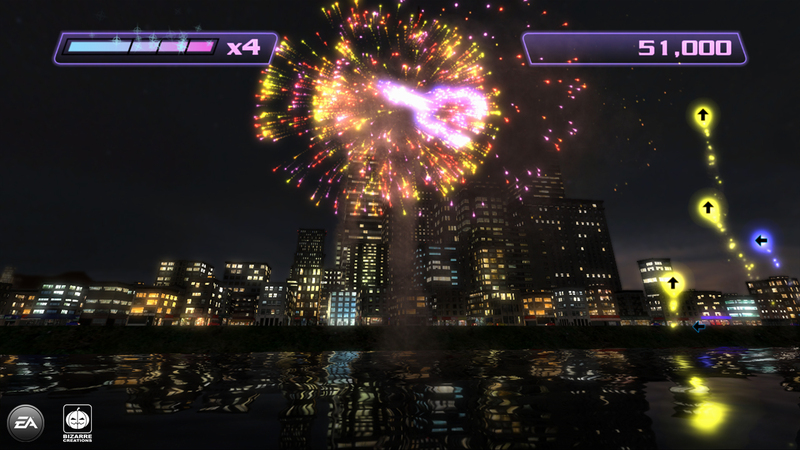 The better the player times the explosions, the more spectacular the fireworks effects. 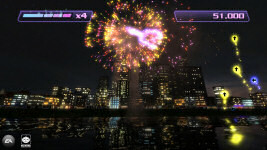 The fireworks are choreographed to 10 original tracks created by Ian Livingstone. 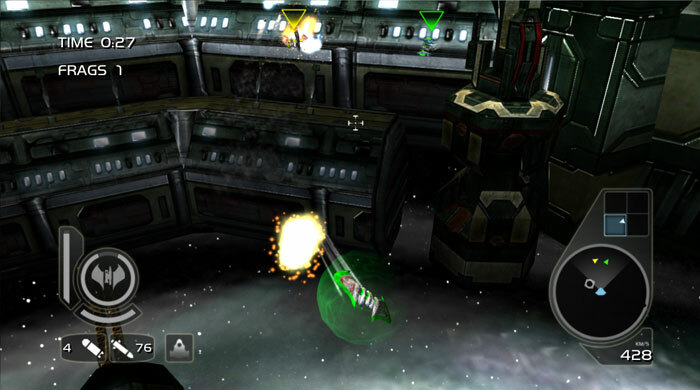 Players can play in single player mode or go head-to-head against a friend on the same console. 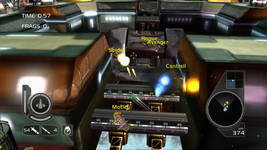 Screenshots and gameplay videos are available from the Boom Boom Rocket website. This week in GameTap: A few oddball PC sim titles (Marine Park Empire, Restaurant Empire, and Zoo Empire), but the real treat are the hidden games: Bug! 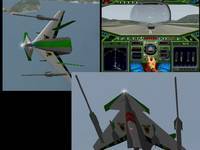 for Sega Saturn, Warlords Battlecry 3 and PC classic Wing Commander. The sims are probably something you could pass by without a tear, but Wing Commander is fantastic, and Bug! 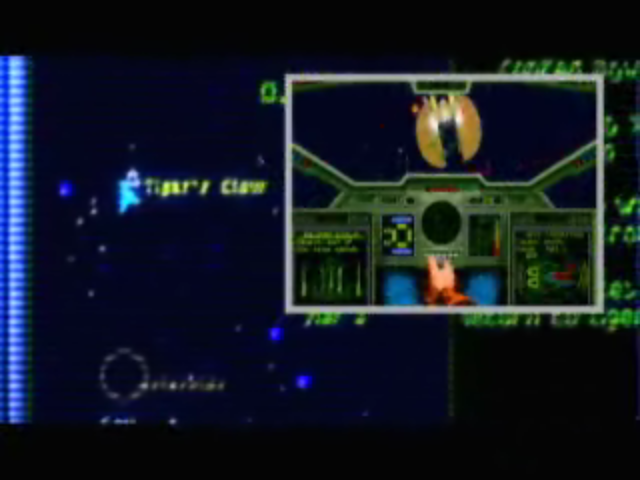 is lousy but cool just because it means you're playing a Saturn game. Here's one we missed: a fan named |K.O.S.H. 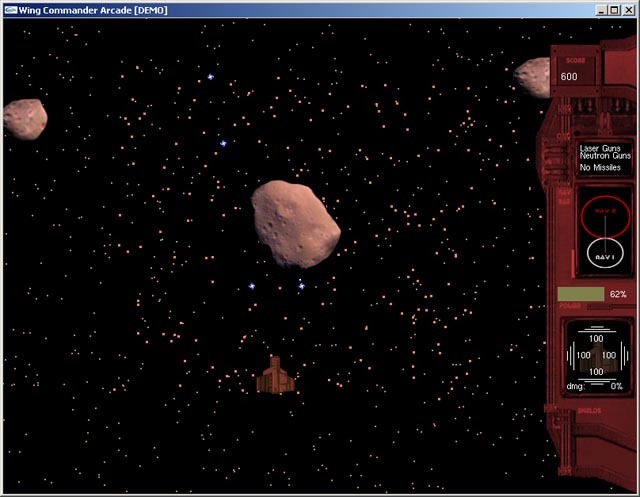 is working on a cool Wing Commander conversion for X3: Reunion. 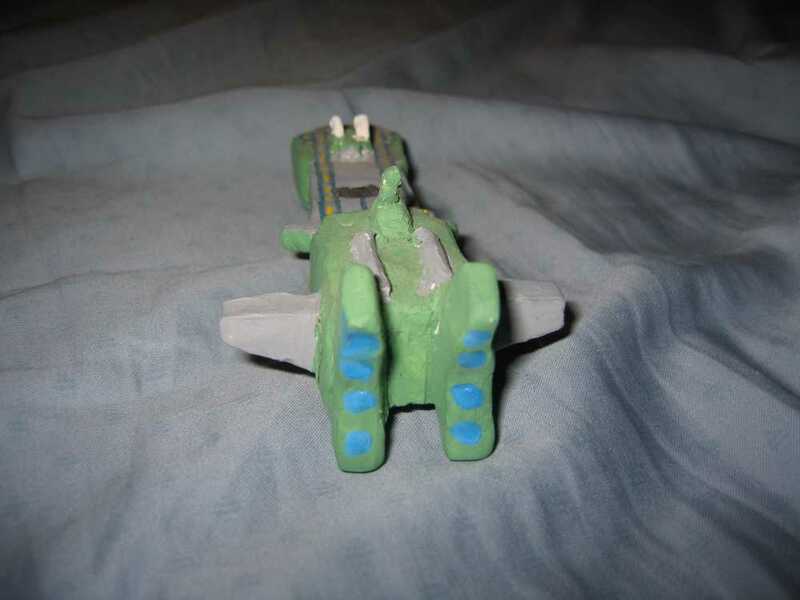 His project includes nine ships from the original Wing Commander with details based on their Claw Marks blueprints. 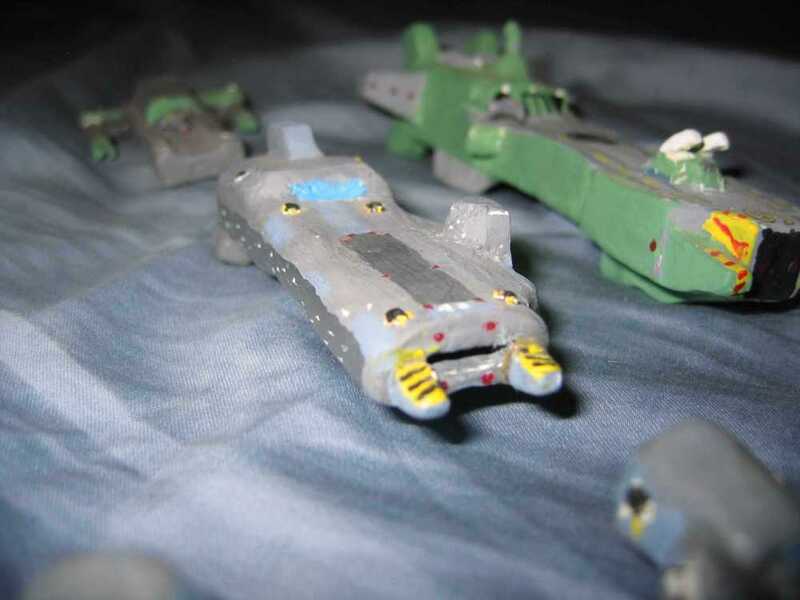 You can find more screenshots and info here, or view some of these models 'under construction' here. 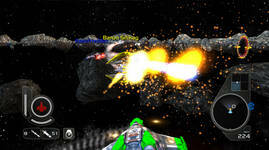 A beta version should be available soon! Wing Commander fans can also find information on previous X3 projects here and here. Here's some emerging talent! 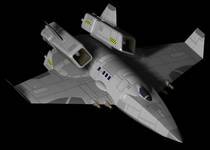 Kevin Caccamo has rendered his first 3D model as part of his Wing Commander 1 Remake project for Flight Commander. 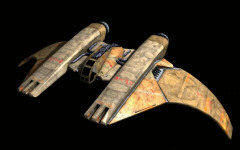 The ship was rendered in Wings3D. 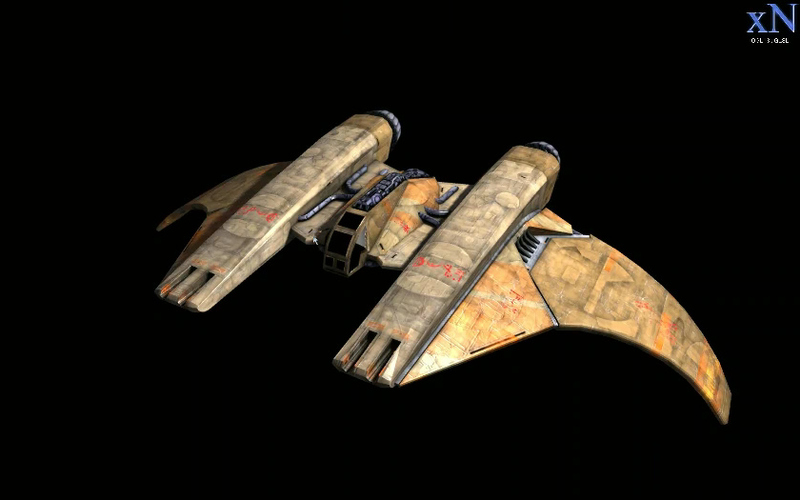 The Dorkir was the standard Kilrathi transport in the original Wing Commander, but they've continued to make cameo appearances since then... they're mentioned in Wing Commander 2, seen on Wing Commander Academy and even have a brief appearance in the Wing Commander movie! 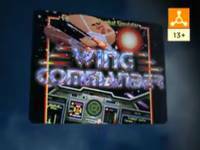 Jetlag has found that GameTap has released a 'commercial' advertising the original Wing Commander's addition to their service. 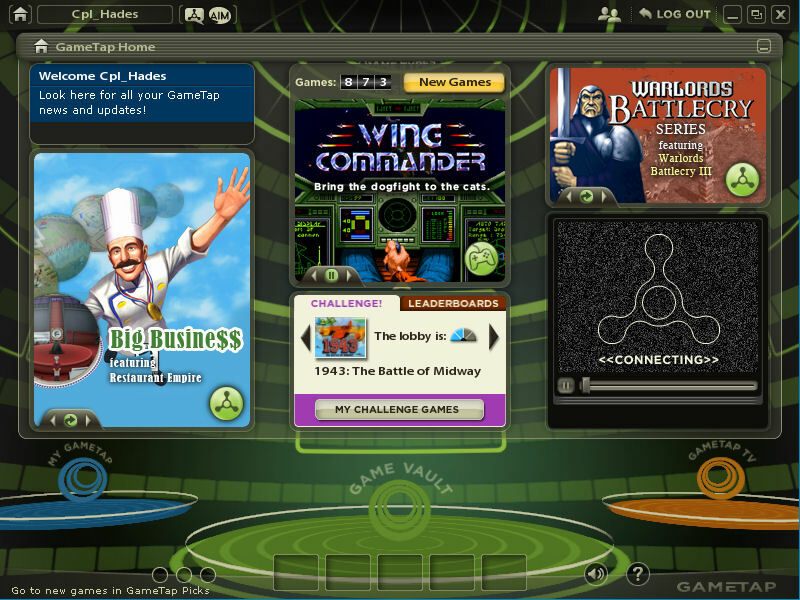 A special video now plays while you're downloading the game (and at other points in the service). The voiceover narration they've come up with is especially cool... and very respectful towards the game! Welcome to the war. 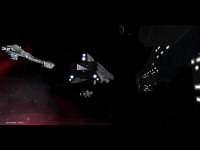 The Confederation needs you. 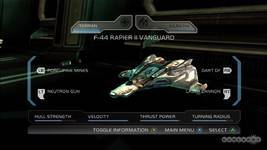 We've held off the bloodthirsty Kilrathi for some twenty years, but they are relentless. One pilot, one savior, could turn the tide of this entire conflict. Is it you? 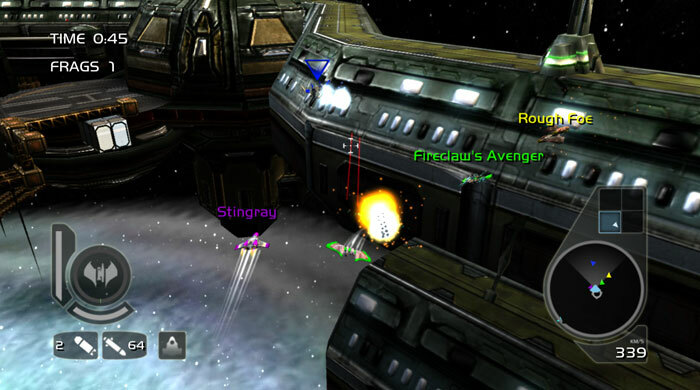 Play the space combat game that launched a thousand immitations: Wing Commander, coming to GameTap. Fans of Origin's other big series will be interested to learn that each of the five available Ultima titles feature a brief video introduction by Richard Garriott himself. 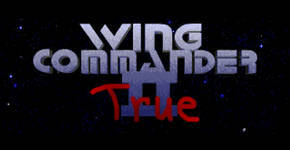 You can download the Wing Commander trailer here (1.1 mb, .WMV format). 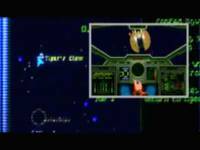 Here's a quick update to report that GameTap has added the original Wing Commander blueprints to their supplemental materials for the game. You can download them here in PDF format. It's very impressive that they were able to do this so quickly... and during a holiday weekend, no less! It sounds like they are very interested in watching out for our best interests -- and that's a good feeling! 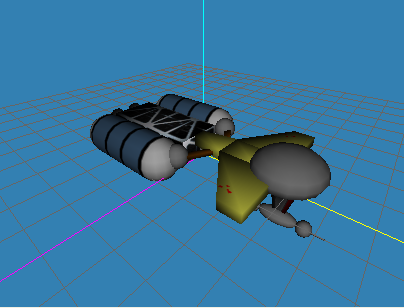 What's more, all four blueprints are included, rather than just the one or two needed to bypass the copy protection. 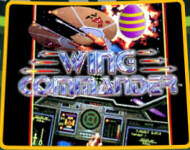 It's the day after Easter, so that means more Wing Commander themed eggs. 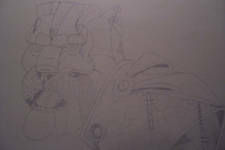 This time there's a few dedicated to Arena! 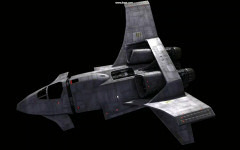 The Wing Commander Saga FreeSpace 2 mod team has released its first three screenhots of the P-64 Ferret patrol fighter. 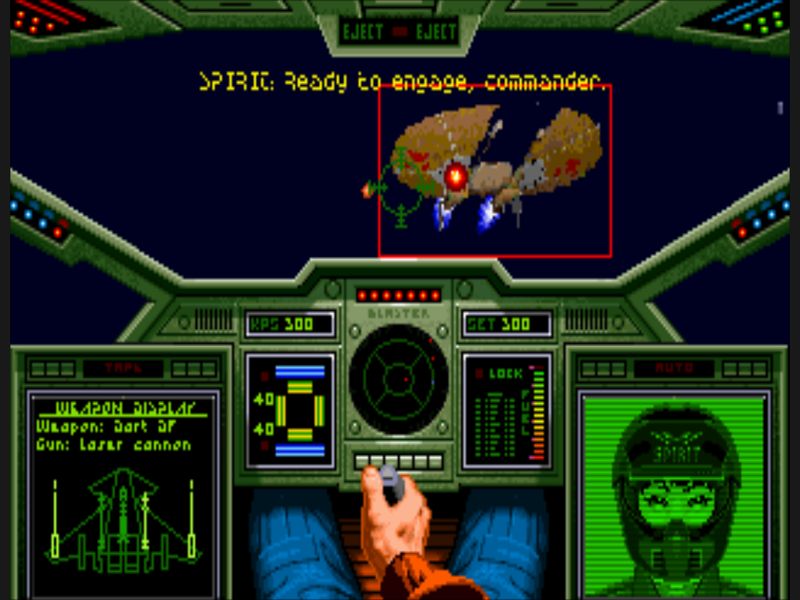 The Ferret was introduced in Wing Commander 2, the first ship available for the player to fly. 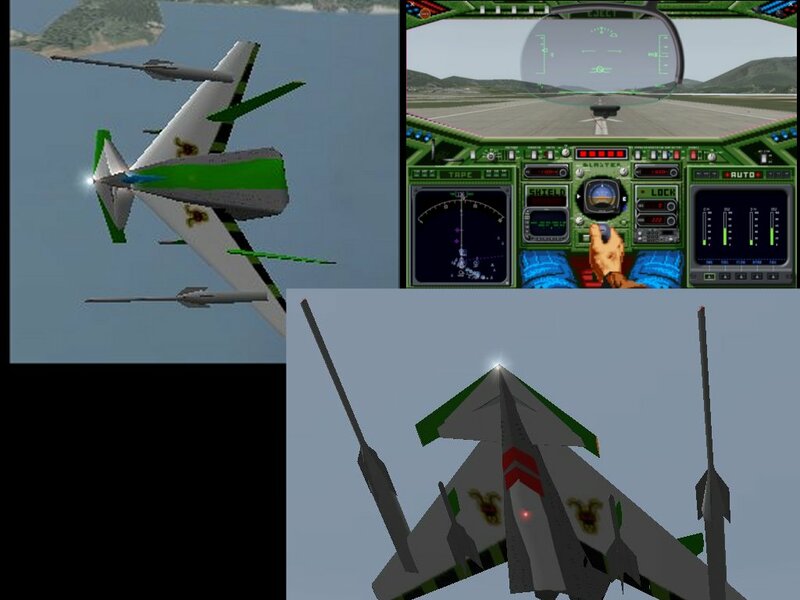 At the time it was an interesting change, trading away missiles and a second VDU for pure speed. 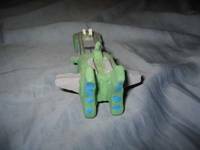 The small fighters have been around a long time - Ferrets flew off the TCS Iason in 2638. 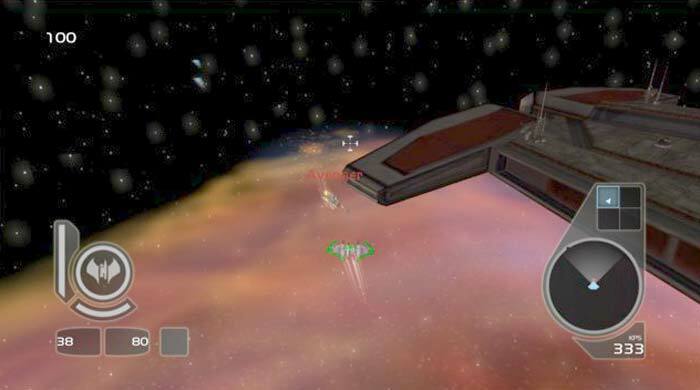 Here's the Saga look -- the first two pictures are in-game images, the third is a TrueSpace rendering. 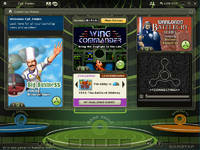 1Up is reporting that Boom Boom Rocket, Electronic Arts' first EA Arcade will be released to the service in mid-April. 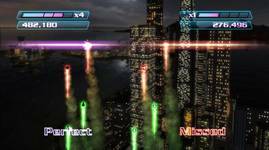 Since XBLA titles are always published on Wednesdays, this means that BBR will probably be released on the 11th or the 18th. 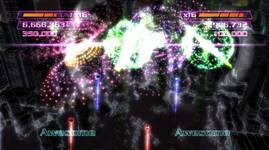 The BBR official site has posted several trailers and a video showing someone playing the game blindfolded. 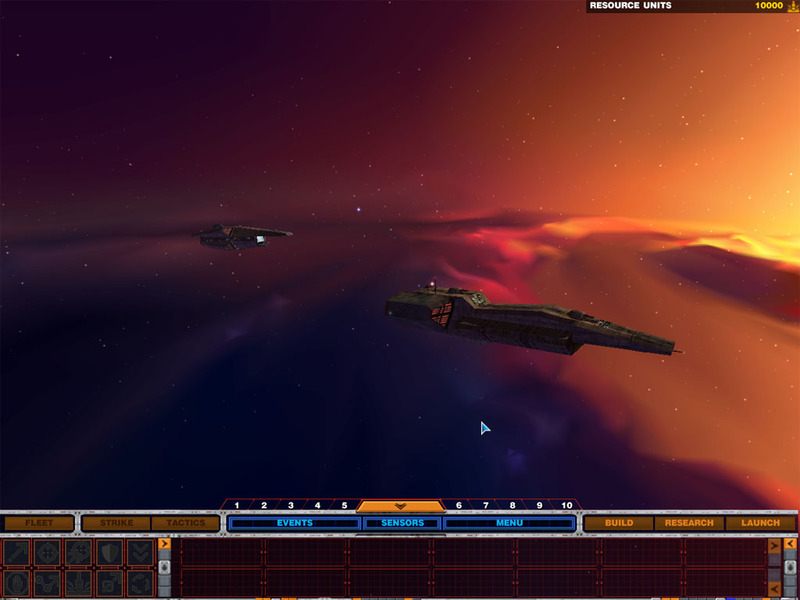 I haven't really figured out how you play this game... but darnit, it looks pretty. 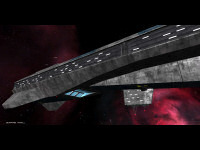 Wing Commander Arena, the second game planned for EA's XBLA, might take a little more time getting out: EA UK has published a new version of the Arena fact sheet to their press site. An earlier version of the document listed "Spring 2007" as the release date... but this release has changed that field to read "Summer 2007". Without further specifics it's impossible to tell what this means... a late spring release is barely different from an early summer one. Nevertheless, you can download the original Word Document here (542 kb) -- suitable for framing! 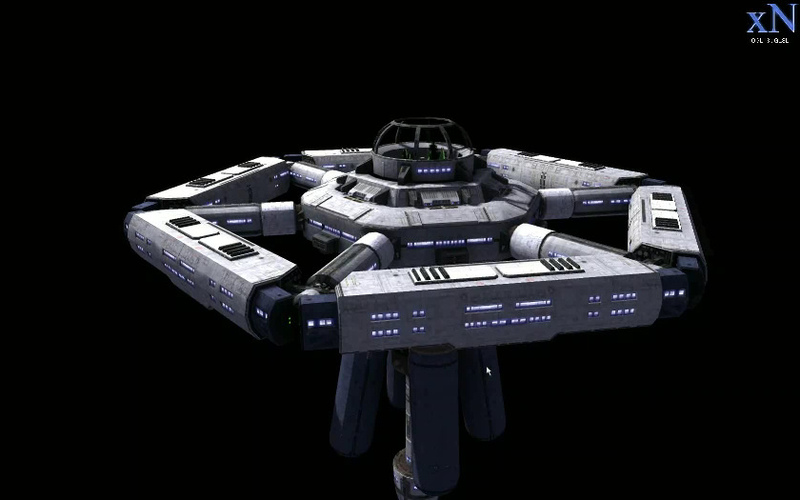 The weight of the Ralari is 18000 tonnes. 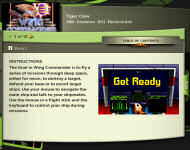 The Tiger's Claw was launched in 2644. Maniac is 23 years old. 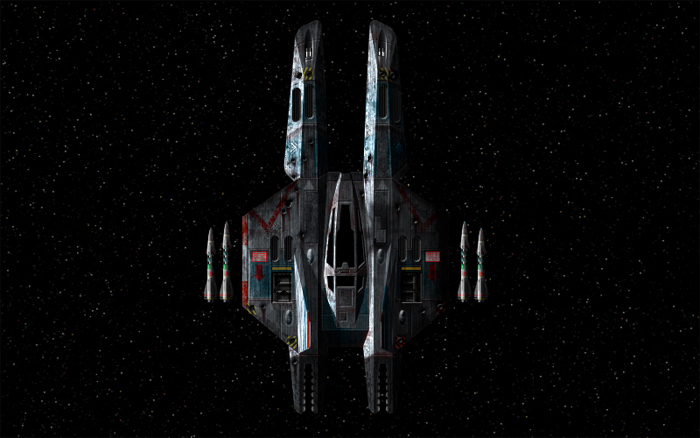 The Fralthi has 28 cm of front armor. 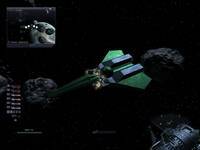 The safe speed in asteroid fields is 250 kps. The ESK rating for the Dart DF is 11000. The ESK rating for the Pilum FF is 9500. 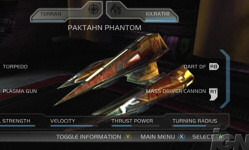 The velocity of the Dart DF is 900 kps. 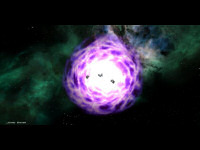 The range of the mass driver cannon is 3000. 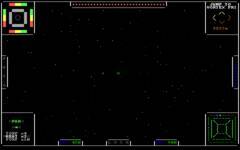 The range of the laser cannon is 4800 meters. If you run into another question please let us know and we'll post the response! 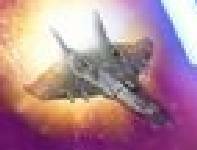 Quality webcomic Starslip Crisis included a completely unexpected Wing Commander joke on tuesday! I'm not sure if it's possible to explain the storyline behind the reference, but K'Tithrak Mang was included in a list of future art museums. You can read the whole strip here or start the storyline which lead to it here. 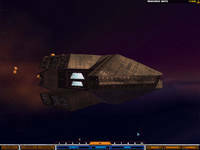 RICHARD GARRIOTT, better known as the game developer Lord British has invited world's top theoretical physicist, no other than Stephen William Hawking - on a Zero-G flight on April 16th. Garroitt is a gaming guru, having created Ultima, Bioforge, Lineage, City of Heroes and upcoming Tabula Rasa. He is also a space nut, investor in Zero-G company and one of trustee of the X-Prize Foundation. Bioforge? This is just the first step for Garriott -- his goal is to shoot down 20 TIE Fighters, becoming a Space Ace so that a princess will allow him to travel through time. Subaru Glad I Didn't Say Toyota? Our favorite developer of Wing Commander titles for the Gameboy, Raylight Studios is turning up the heat with a GBA port of the gritty street racing / girlfriend collection simulator Street Racing Syndicate, so all you import tuners better take notice. SRS's JDM-sweet action is set to powerslide from the GBA screen like a Corolla with a tofu cargo that must get through thanks to Raylight's impressive Blueroses graphics technology. With more than 40 modifiable rides and two-player mode, it's sure to be a wild drive. But wait - that's not all! 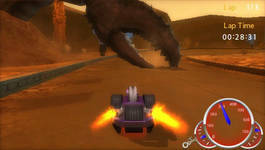 New for PSP is Hot Wheels Ultimate Racing, with over 20 licensed cars of its own, and an amazing stunt ramp made from a live anglerfish, I think. 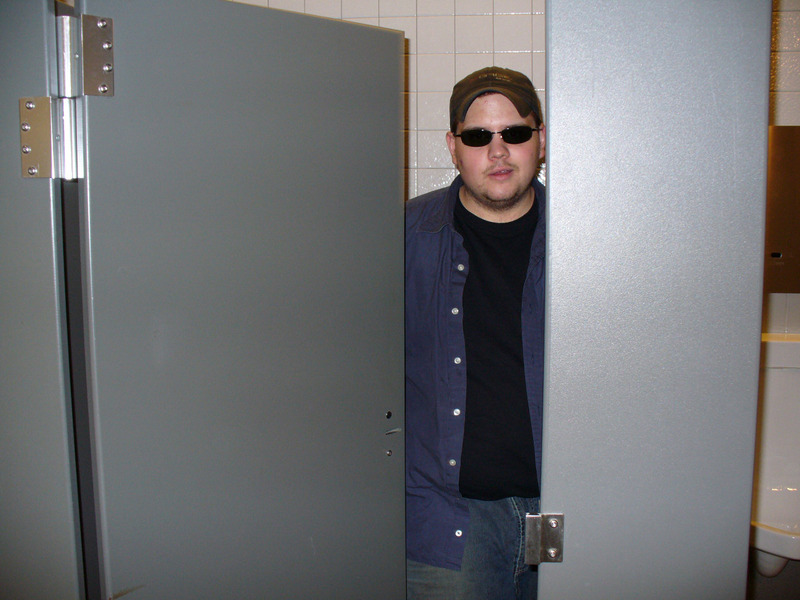 Keep in practice, fellas, one never knows when you may be called upon to portablize another WC. 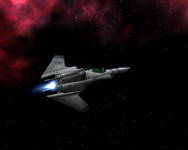 The F-44 Rapier II Blade, developed by human company Origin Aerospace, has scored more space-to-space kills than any other Confederation fighter. 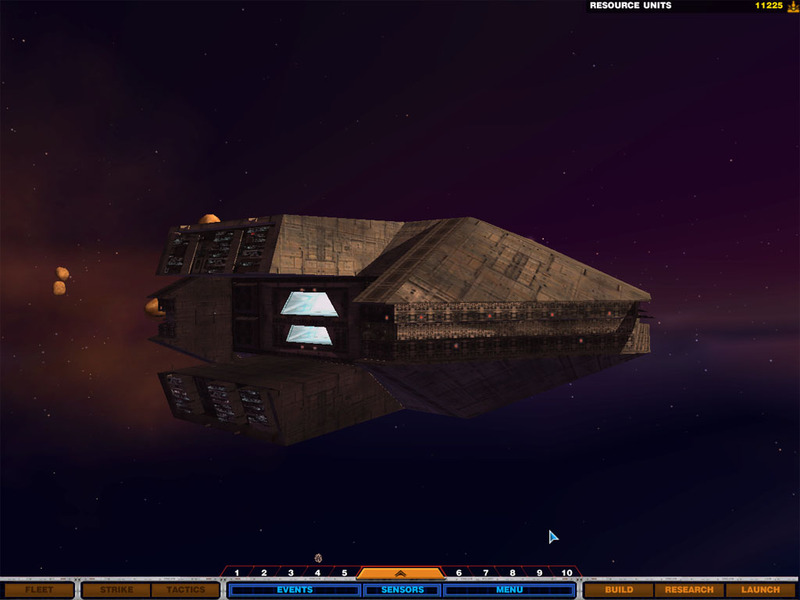 Even though this ship is an Earth leftover don’t underestimate it’s capacity for destructive skirmishes. 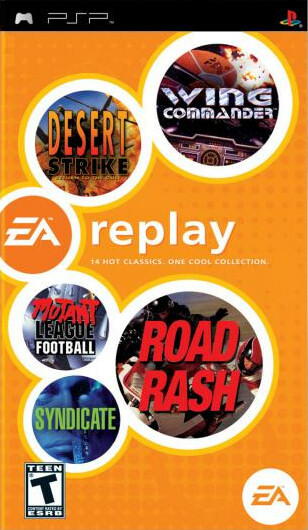 Good news for everyone dreaming about someday playing EA Replay for the PSP: GameSpot is reporting that the MSRP for the core system is being reduced immediately by thirty dollars! You can have your PSP (and eat it, too) for only $169.99. 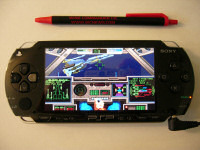 The PSP is a good solution for handheld video viewing... and for handheld space combat! Hopefully you've already realized that yesterday's updates were fake. 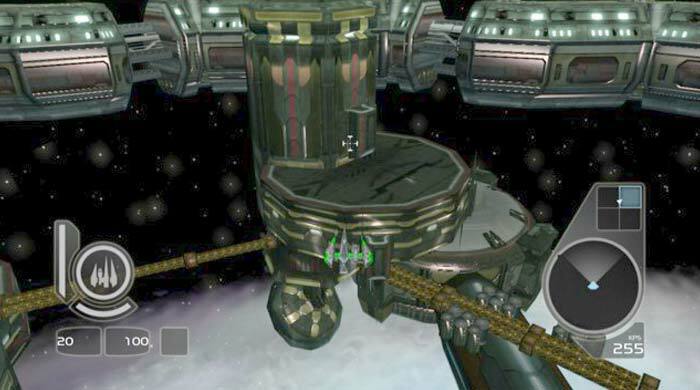 Freespace: Coliseum was a loving criticism of both Arena and our favorite runner-up game series (which just goes to show you, there's a first time for everything...). 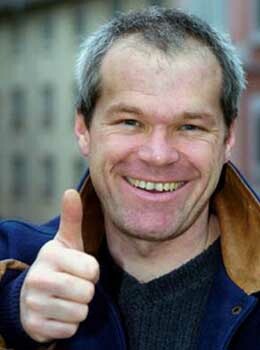 As for the Crusader movie, I think we realized too late that you can't write a parody version of Uwe Boll... so an unfair number of people were actually 'fooled' by that one. 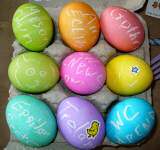 Our apologies -- that's never our intention with April 1st updates. 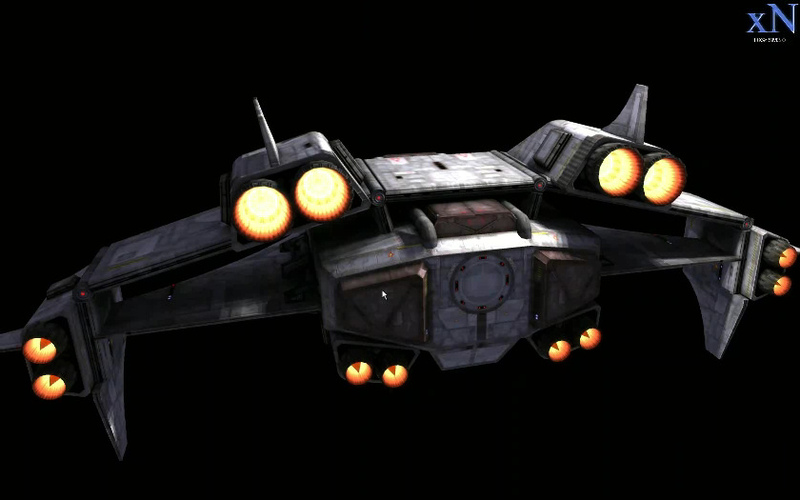 Perhaps the coolest thing to come out of April 1st this year was a pretend article by German gaming magazine PC Games Online... which claimed in a serious tone that "Wing Commander Online" was in the works. That's interesting to me because it's close enough to the truth in 2007 that people can believe it... and in another year's time, it might not even be a joke. This one is no April Fool's joke: I am proud to announce that the CIC is adding a new staff member! Asher "Frosty" Lawson joins our ranks with a focus on graphics and layout work (but you'll also be seeing his name on update bylines). This is a unique honor: he is the first staff addition in almost eight years -- since KrisV joined the team in 1999. 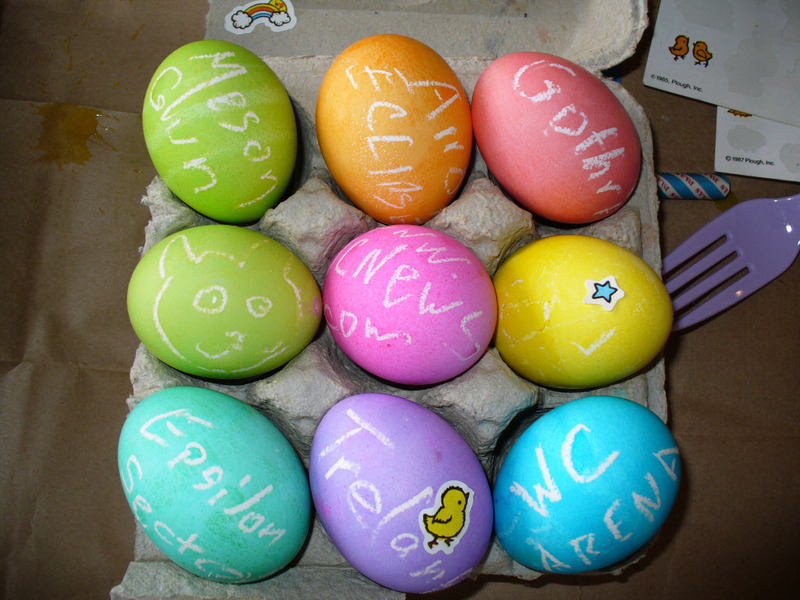 Frosty is an excellent web designer, a dedicated WingNut and an all around good friend. 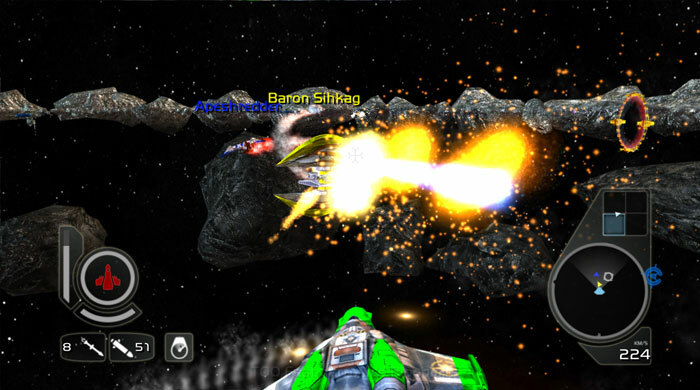 We're lucky to have him, especially now that the Wing Commander community is poised to grow by leaps and bounds. 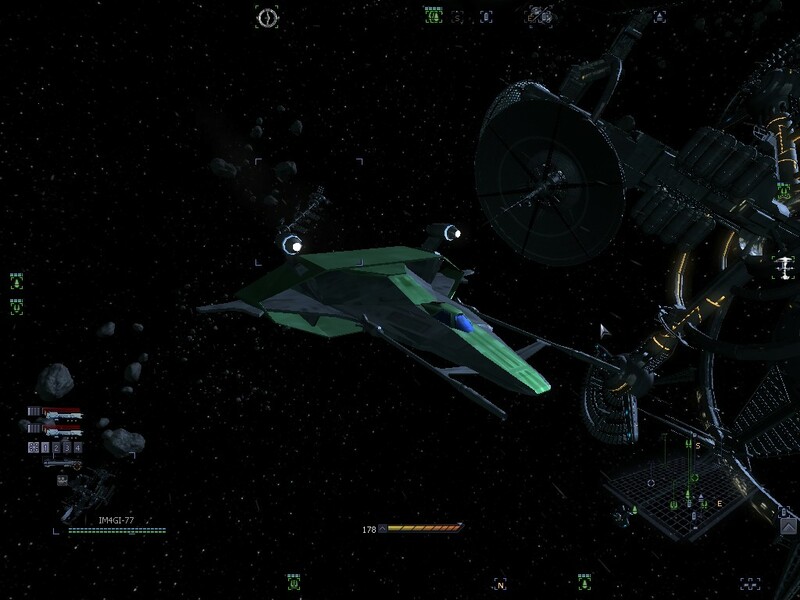 Long live the Confederation and look forward to great new content! 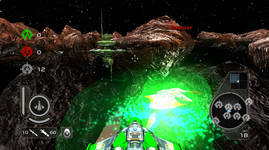 Volition Inc., in concert with developer 3000 AD, announced today the impending release of Descent: Freespace: Coliseum for the Xbox Live Arcade (XBLA). 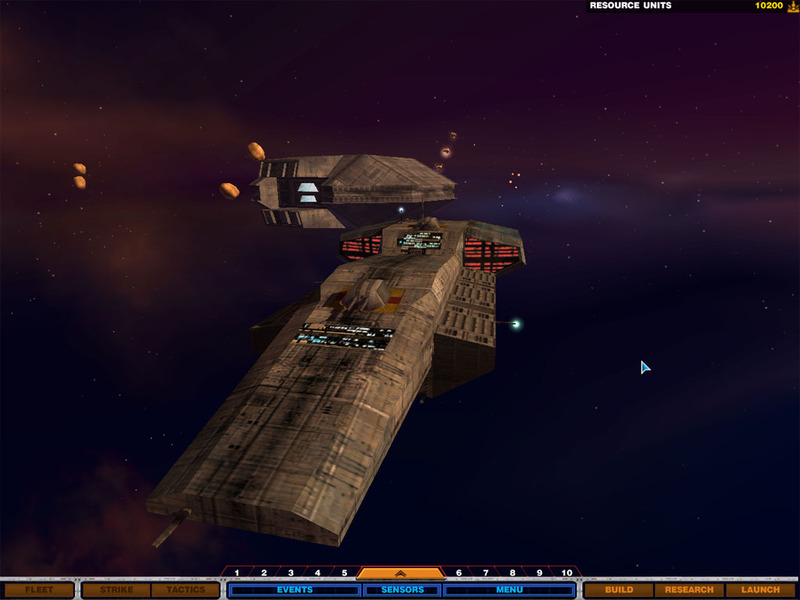 The new game collects familiar Freespace ships and lore on an innovative new one-dimensional 'back and forth' playing field. 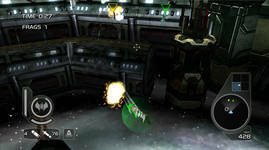 Executive Producer Shaun Nickel says that the game is sure to appeal to both the existing fans, and as many as another two. "We've got Terrans, we've got Vasudans, we've got mining robots -- what's not to love?" He added: "Plus, it has really, really big ships!" # With up to 17 players, Freespace Coliseum offers the largest multi-player melee experience to date on Xbox Live Arcade. 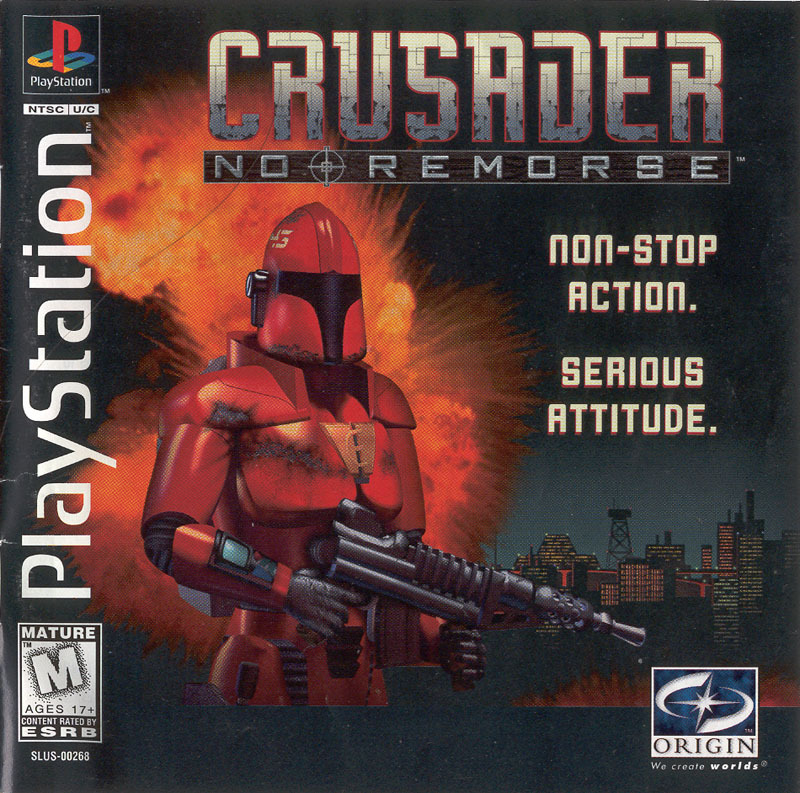 I'm really excited about being able to work on a Crusader movie. 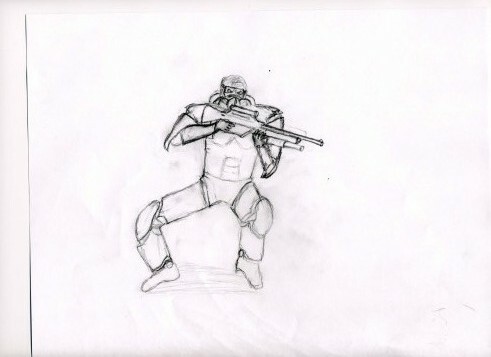 I had originally wanted to make a movie based around the exploits of the Boba Fett character, but George Lucas gave me hell. 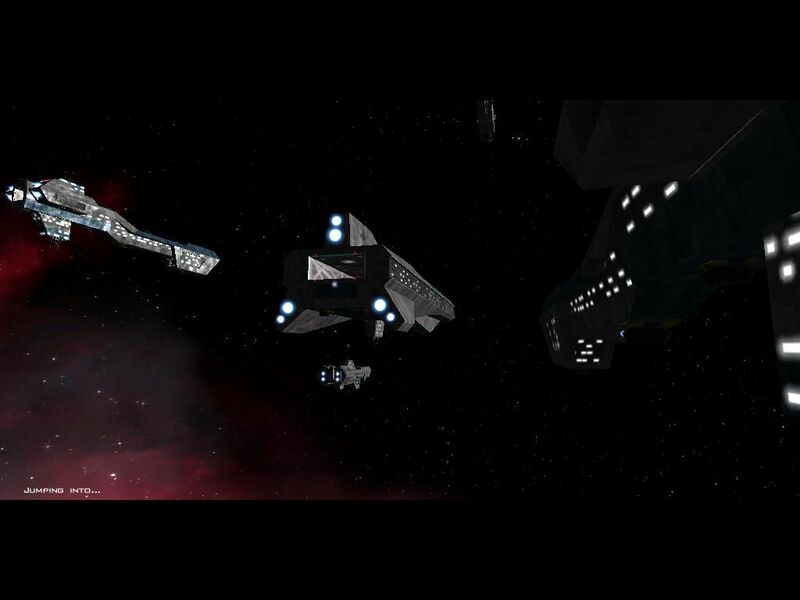 Then I remembered this game I used to play with an identical character and decided to make a movie on that. We're going to try and get someone heroic like Matthew Lillard to play the Bounty Hunter and he'll be fighting some very cool monsters. 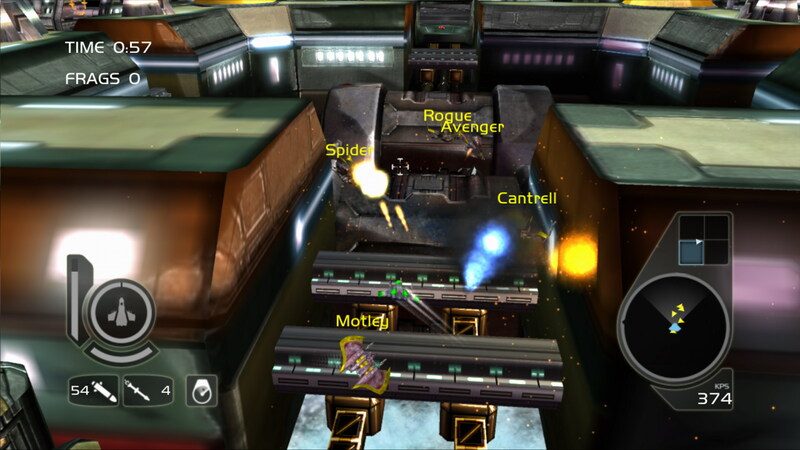 In the games you were always fighting robots, robots, robots, and so I said enough! The fans want to see beautiful women, so we are hiring many beautiful prostitutes to play the aliens. 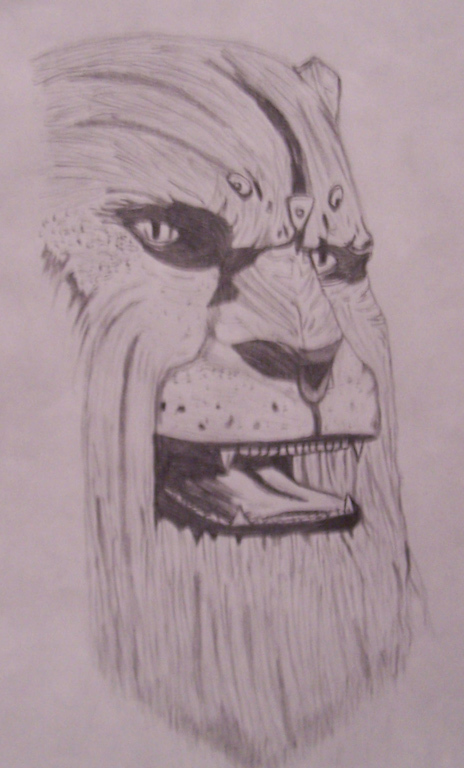 You will see, this will be the biggest thing yet. 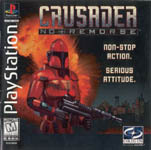 The movie, provisionally titled Crusader: No Shame, is slated for release in early 2009. 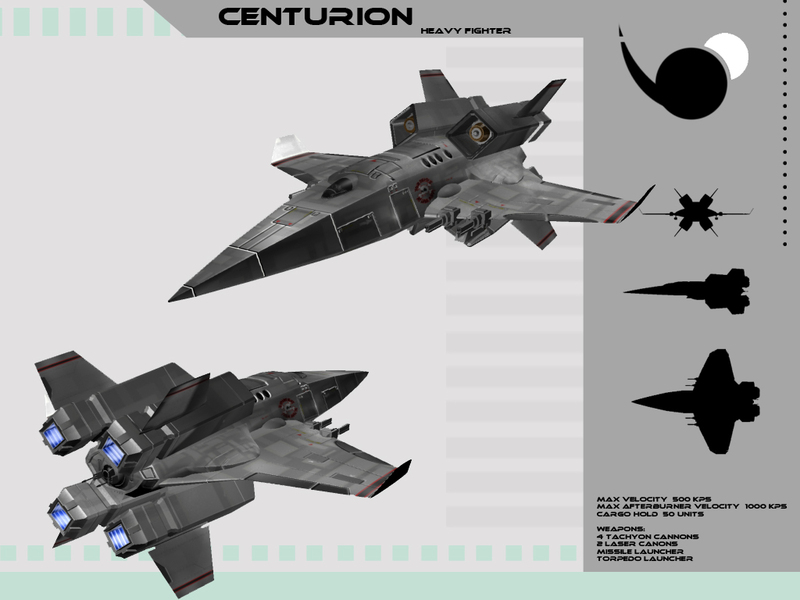 To celebrate the recent announcement of Wing Commander Arena, here is a pack of commemorative wallpapers that highlight key headlines that were in the news. 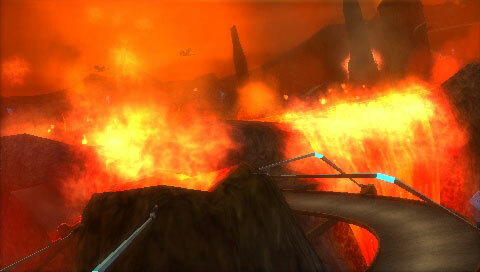 Famous updates such as "First Arena Screenshots" and "ESRB Announces Arena Rating" are all included. 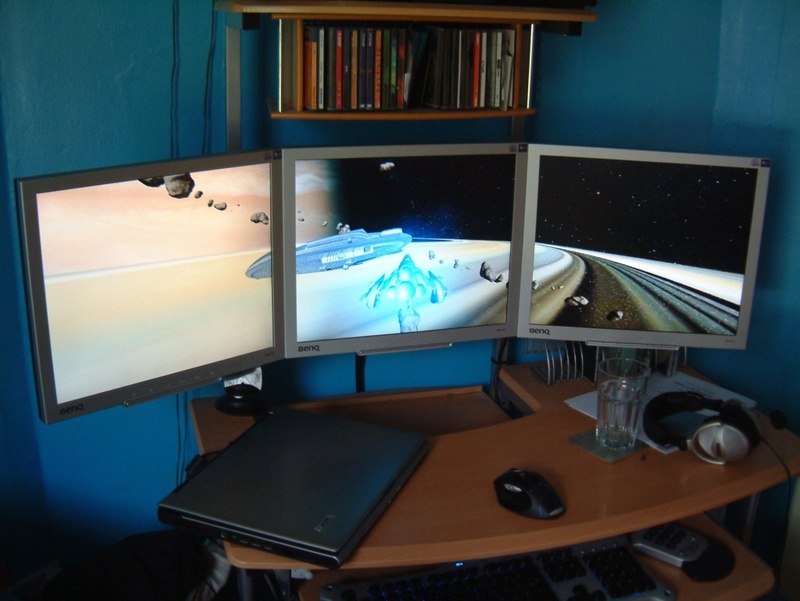 This is a great way to relive some exciting times all day long. You can find similarly awesome background images in our Wallpapers section. Reports have surfaced that Akkbar has packed up all his things and rushed to Alaska to strike it rich. After staking a claim near the Klondike River, he's discovered that he's 110 years too late and no gold is to be found. 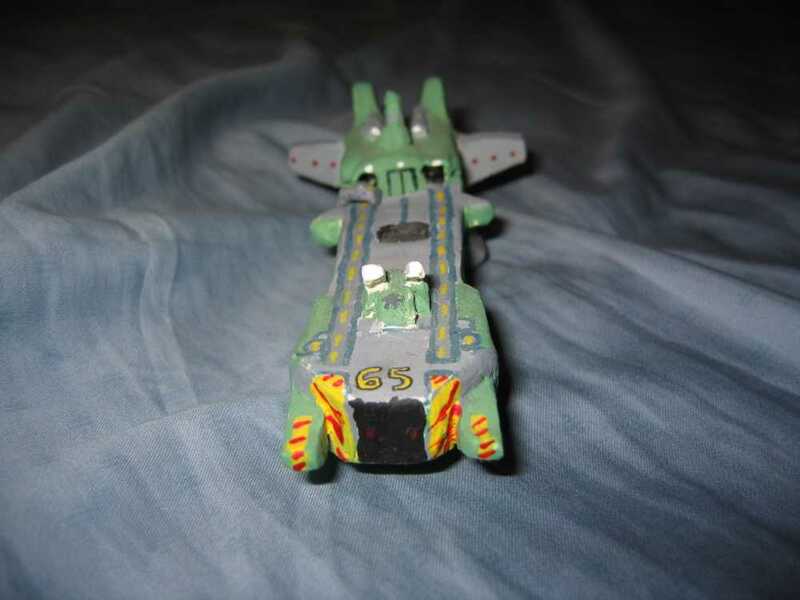 He's now in the process of selling off his Wing Commander collection to pay for a ticket home.